Ok, where were we? 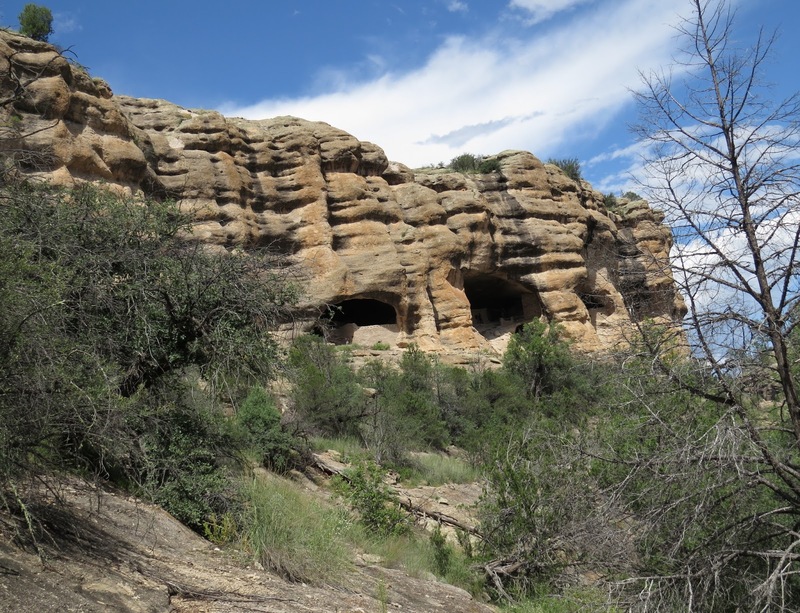 Oh, that's right, we had just concluded the fourth and final day, August 30, of the New Mexico Dragonfly Blitz in southwest New Mexico, along the Gila River near Gila Cliff Dwellings National Monument. After a great dinner at Tienda del Sol, we joined Dave and Shelley Small at the home they rented in Pinos Altos, Grant County, New Mexico. There, Dave had set up some lights to attract moths and other insects. At 7,000 feet in elevation, the habitat is dry, mixed conifer forest with oaks, too. Since it was after dark when Heidi and I arrived, it was difficult to make out many vegetation details. 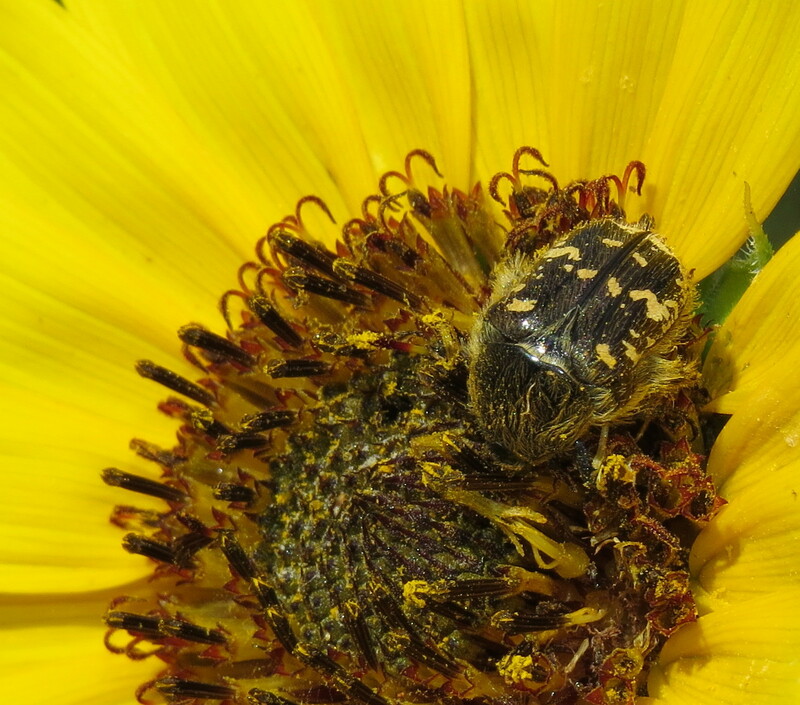 The insect fauna alone suggested good floral diversity. I am still a relative novice at identifying moths, even to family level, so my apologies if some images here are misidentified. I will update this post as I learn of any errors. 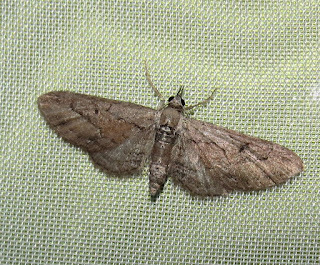 There were more than moths flocking to the blacklights and porch lights, though. Take true bugs for instance. 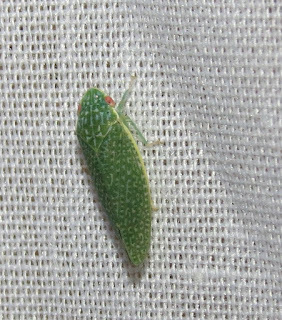 Leafhoppers (family Cicadellidae) made a good showing, including a lovely green Rugosana species with red eyes. 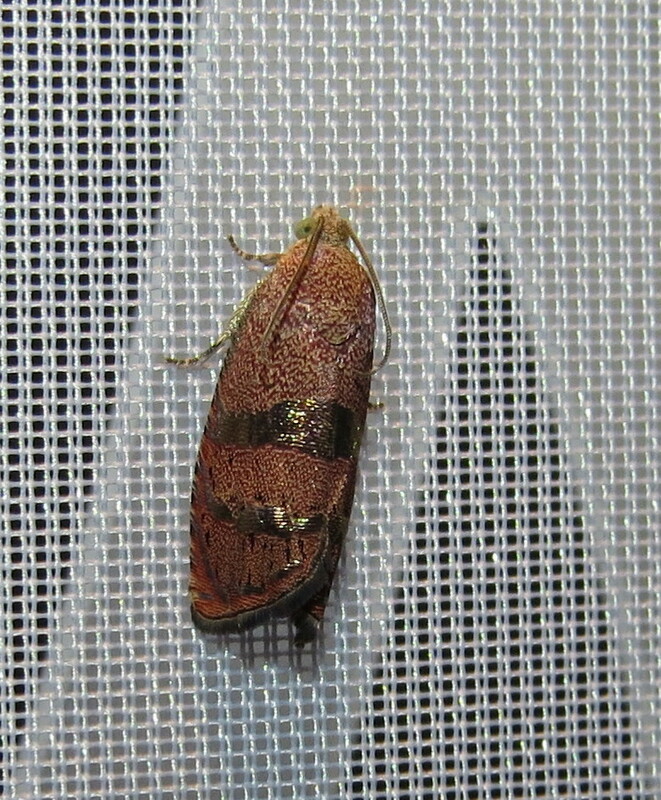 Easily mistaken for a leafhopper was a conifer spittlebug in the genus Aphrophora (family Cercopidae or Aphrophoridae, depending on which authority you consult). 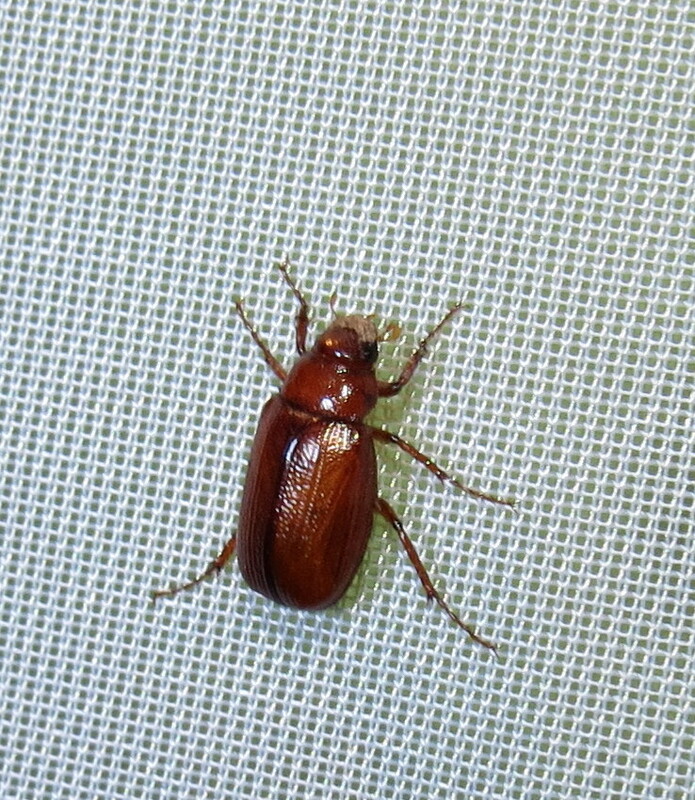 Beetles, too, were present in fair numbers and diversity. 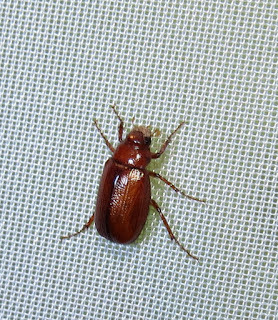 Colorful foliage ground beetles in the genus Lebia are relatively small, but draw attention with often bright metallic wing covers. Sap beetles, family Nitidulidae, are frequently drawn to lights at night, but they also come to fermenting sap, fruits, and similar substances at all hours. 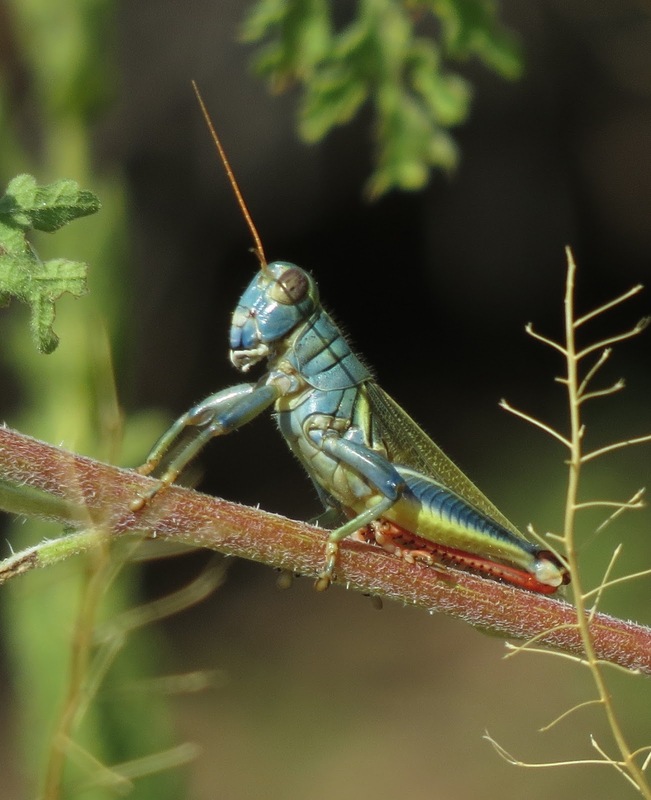 I guess they are the closest things to "insect alcoholics." 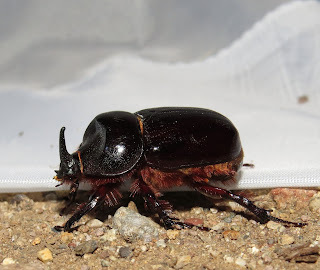 Many kinds of scarab beetles find their way to lights, including small chafers in the genus Diplotaxis, and those friendly giants we were seeing everywhere, the rhinoceros beetles Xyloryctes thestalus. Clumsy as they are, I am rethinking wearing a helmet next time we do blacklighting. 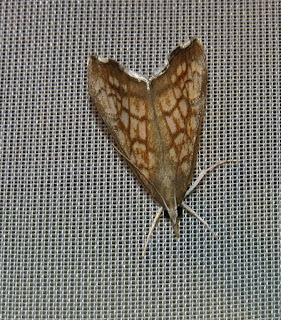 Moths were mostly what Dave wanted to find, and he was not disappointed. 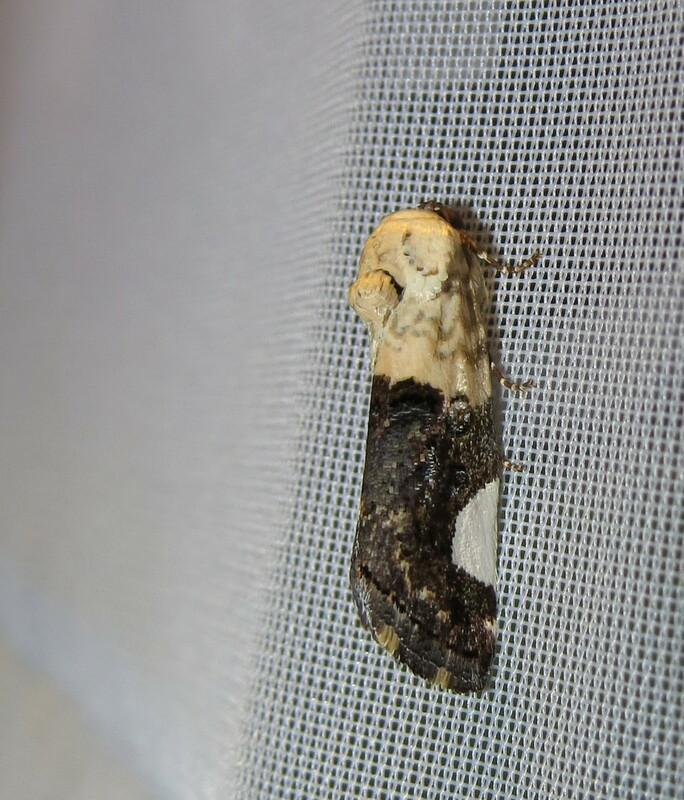 Moth diversity is apparently inversely proportional to the size of the insect. 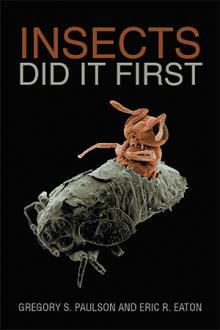 "Micros" are where it's at, but good luck with that. 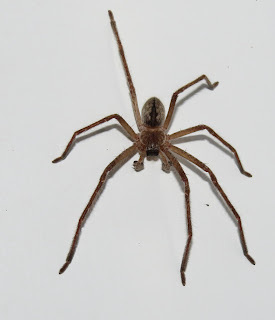 Identification rests mostly on characters that are either too small, too concealed, or otherwise invisible to the average human eye or camera lens. Many species, even genera, can only be determined by dissecting the genitalia of the specimen. With that in mind, my identifications must be regarded as mostly tenuous. 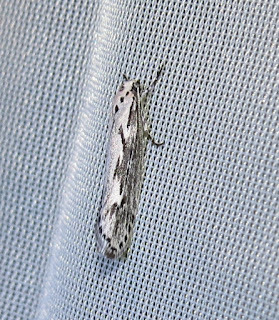 Moths in the genus Ethmia, family Depressariidae, are only "depressing" in their uniform black, white, and gray colors. All the species look pretty much alike, and most of the 50-odd species north of Mexico occur in the southwest U.S. Larval host plants are overwhelmingly in the Boraginaceae, Ehretiaceae, and Hydrophyllaceae. The adults are relatively large for micros, 10-15 millimeters from nose to folded wingtip. 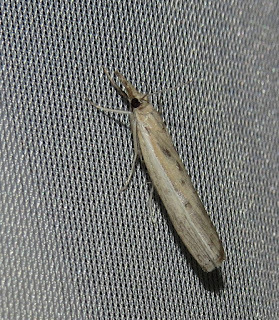 One of the more exotic-looking micros we found were members of the genus Aristotelia in the "twirler moth" family Gelechiidae. They are tiny, but boldly marked. Only 35 named species are known north of Mexico, but there are many more awaiting description by scientists. Each species specializes on a particular plant, but overall many families of plants serve as food for the caterpillars. If I have the identity of this next one correct, it is a member of the genus Argyresthia, family Argyresthiidae. These are certainly true micros, only 3.2-6.8 millimeters from head to wingtip. 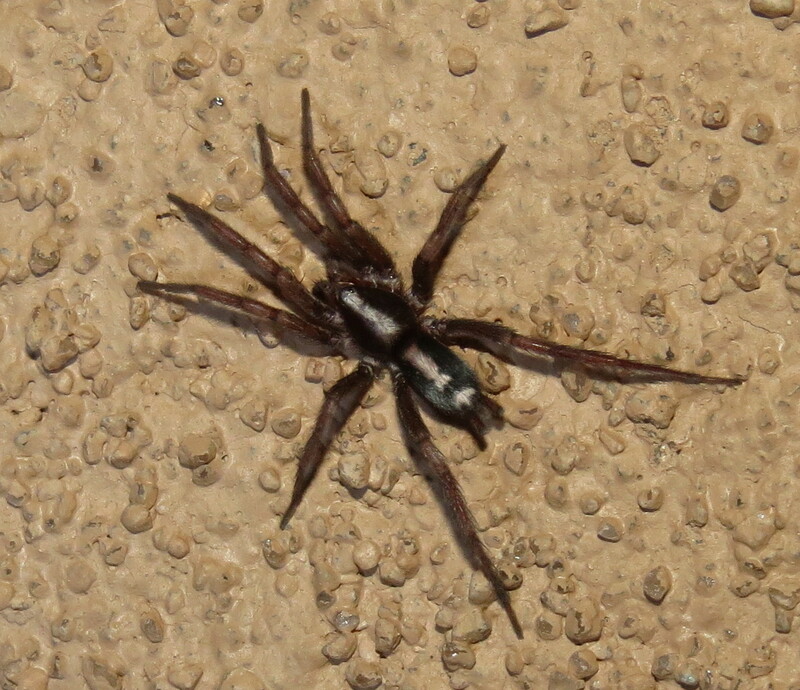 Most are white with broad, transverse metallic stripes like the one shown here. 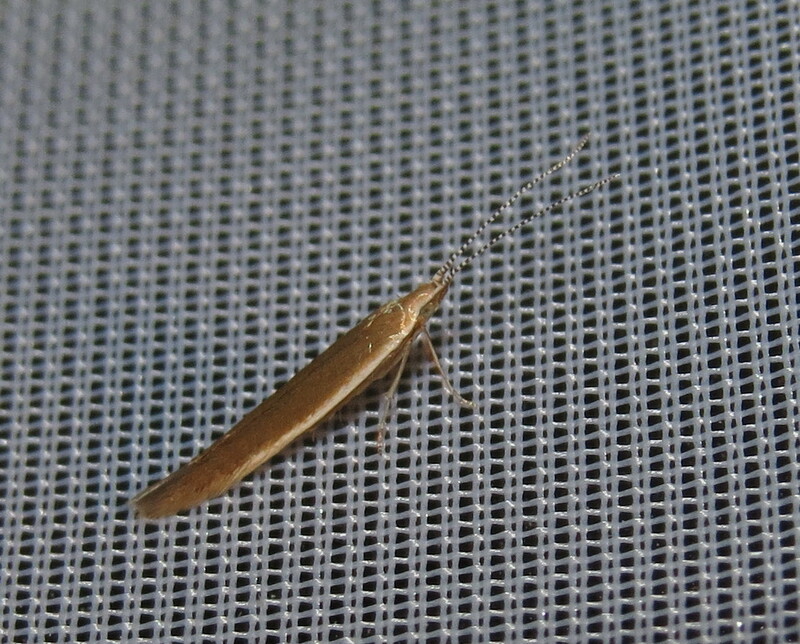 Larvae are miners of conifer needles or broadleaved plants. That means they feed between the layers of plant tissue. There are over fifty species known in North America. This last micro is pretty confounding. I think I have it narrowed to Ypsolophidae or Plutellidae. 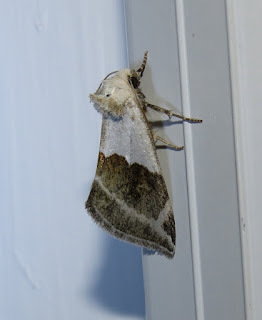 You can't go too wrong because even expert lepidopterists disagree as to whether there are even two families here. "Yps" are split from "plutes" by some scientists, but not by others. Over 300 species, worldwide, fall under one or both of these families. 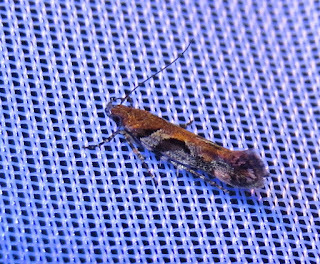 The moths are only 6-13 millimeters long, but the forward-projecting, often banded antennae help to identify them. 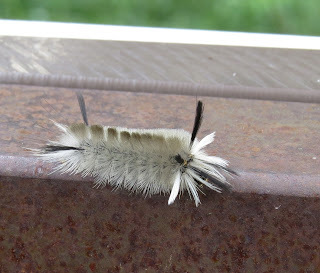 Caterpillars make loose silk webs on the host plant they feed on. 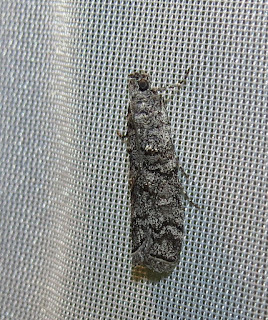 Ok, enough "small talk," let's look at some bigger moths. I guess some of these are still technically "micros," but at least they are large enough you can get a decent look at them. 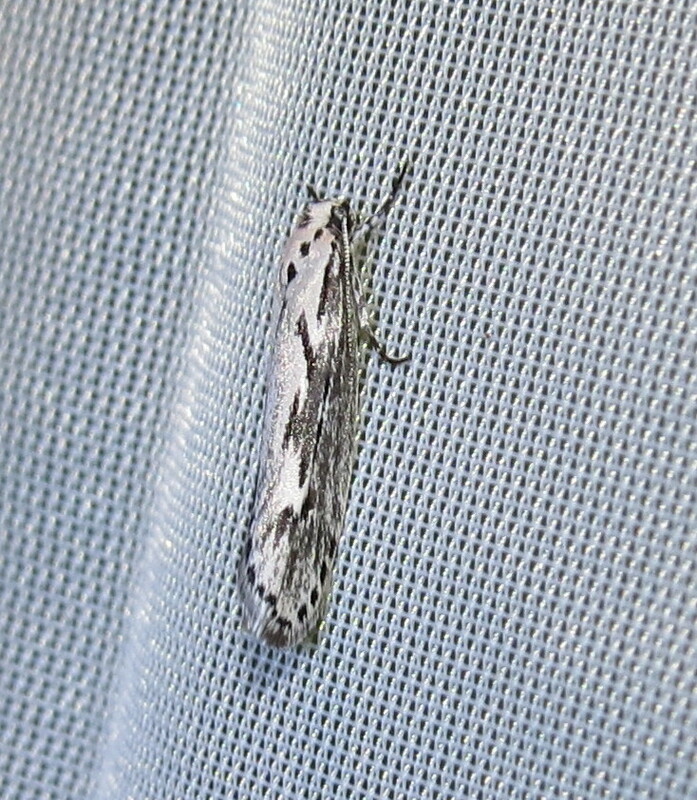 Snout moths in the family Crambidae all tend to look like this one: slender, wings often rolled around the body, and with the labial palps are greatly enlarged, heavily scaled, and projecting forward like a "snout." 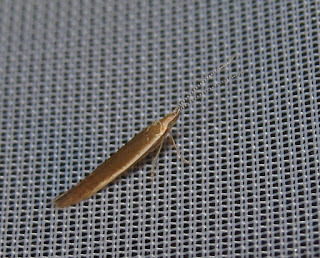 Larvae are associated mostly with grasses, as foliage-, root-, or stem-feeders. 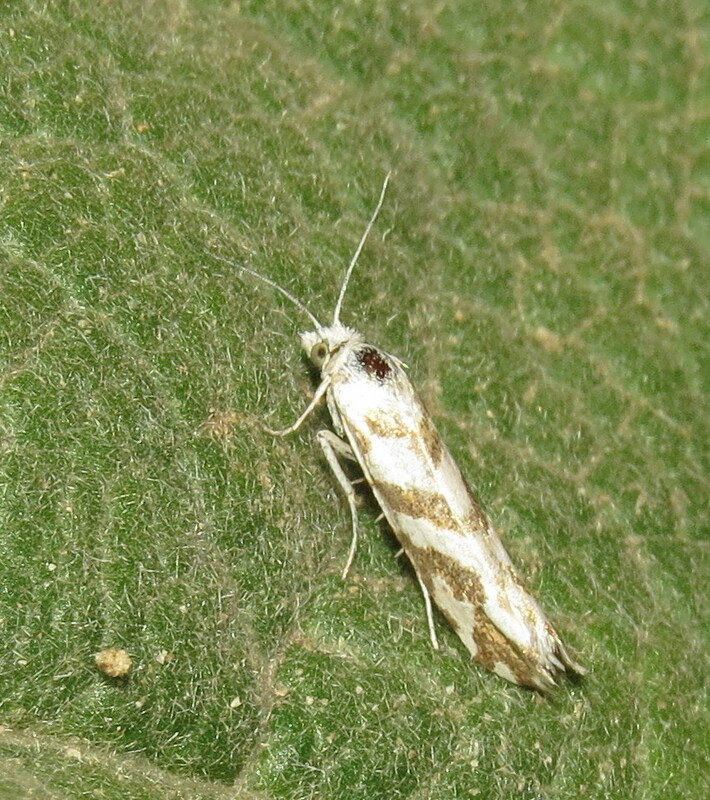 A different crambid, Hydropionea fenestralis, was abundant. 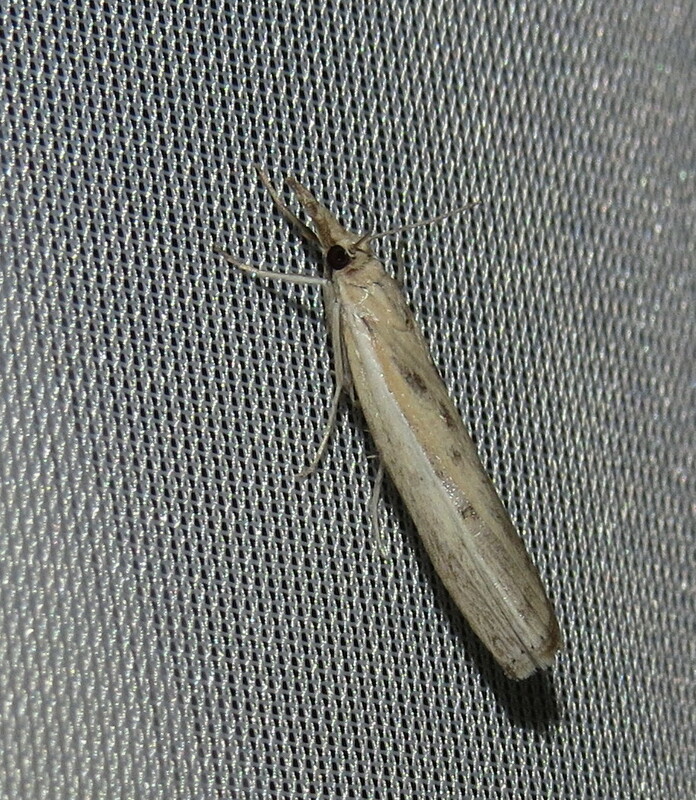 The wings, 12-15 mm. 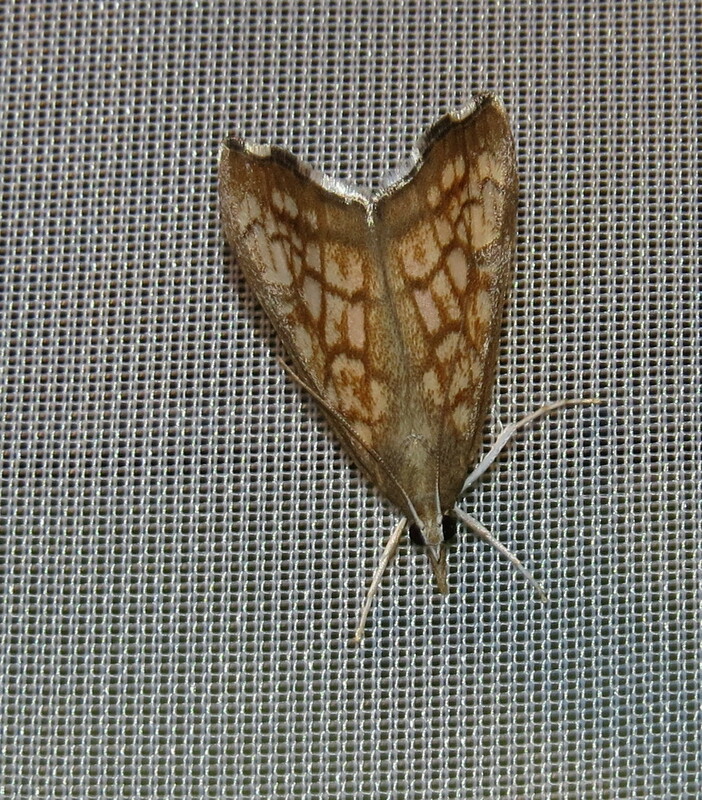 long, sport a lovely reticulated pattern. 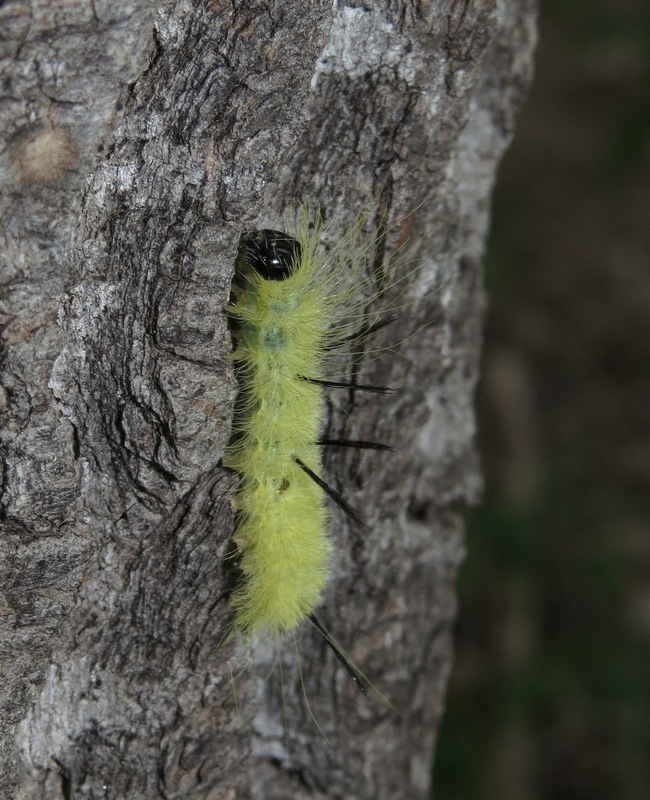 Amazingly, the caterpillar's life cycle remains unknown. 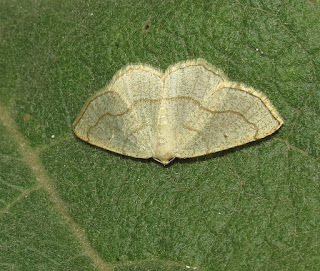 Members of the genus Dioryctria, family Pyralidae, could be called "coneworm moths" because the caterpillars of most feed in conifer cones, but some in foliage shoots or under bark. 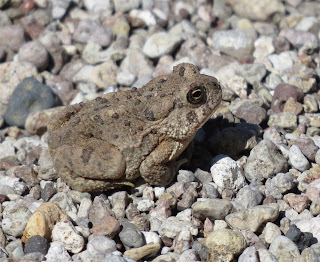 Twenty-five of the 40 known species north of Mexico occur in western North America. The adults are only 10-15 millimeters long. 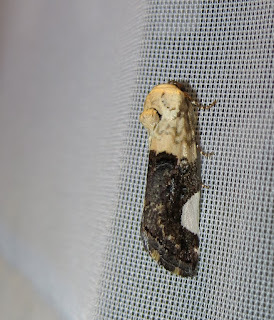 The family Tortricidae, which includes leafroller moths, was represented as usual by our old friend the Filbertworm Moth, Cydia latiferreana, and the Codling Moth, C. pomonella. 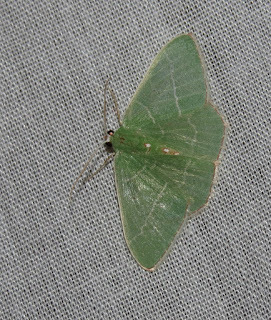 Inchworm moths, family Geometridae, were perhaps the most diverse of the moths at the lights, and the most difficult to identify. Most, in fact, I have yet to place. 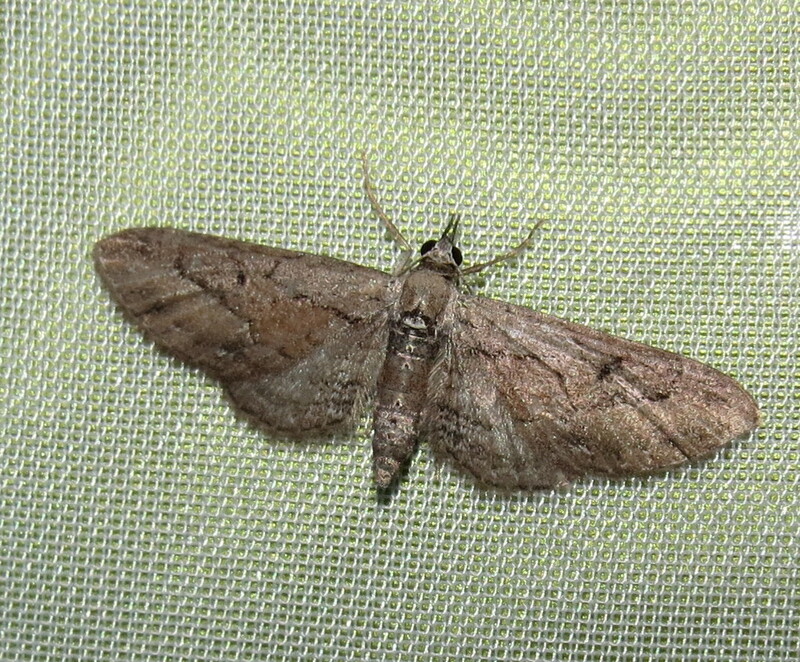 "Pugs" in the genus Eupithecia are readily recognized by their narrow wings and unique resting posture. 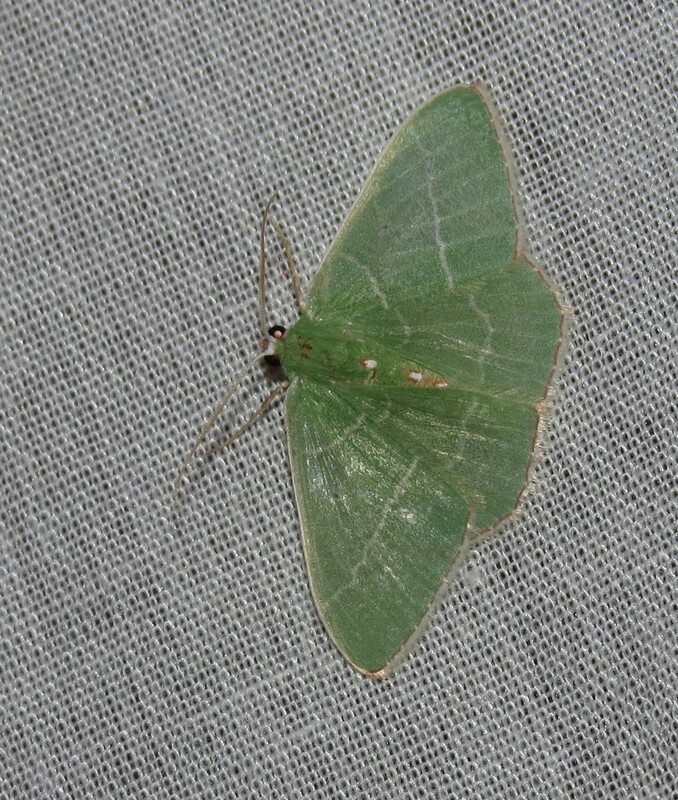 "Emeralds" are green, but they represent several genera. Here are a few more visitors I could not identify. 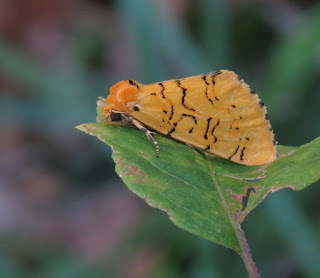 Owlet moths in the family Noctuidae were common, too, and included this stunning bird-dropping mimic, Tarache areloides. 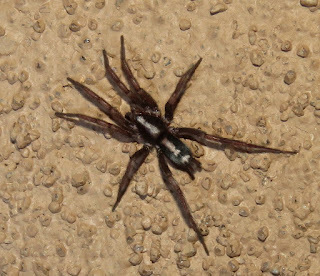 Equally amazing were two specimens of Plagiomimicus dimidiata. 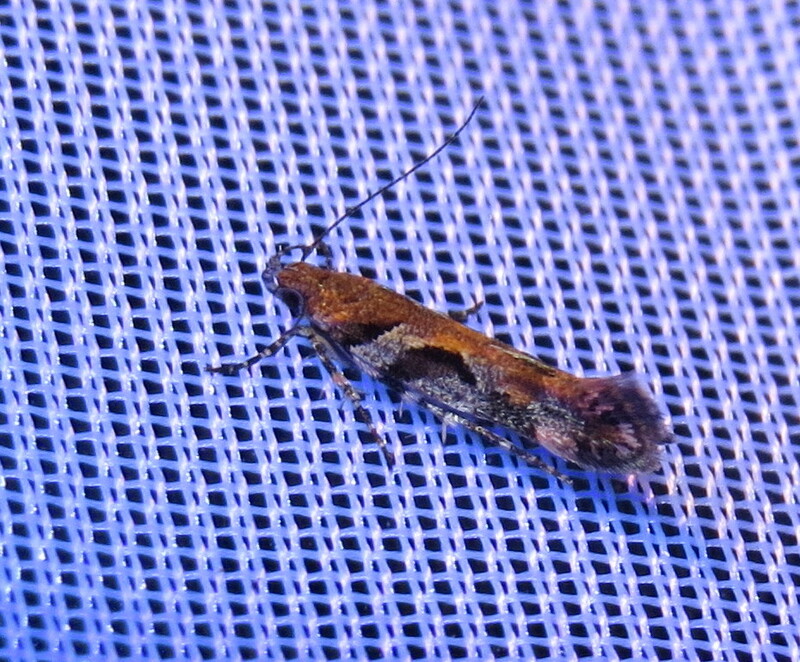 The early life stages of this moth are unknown. 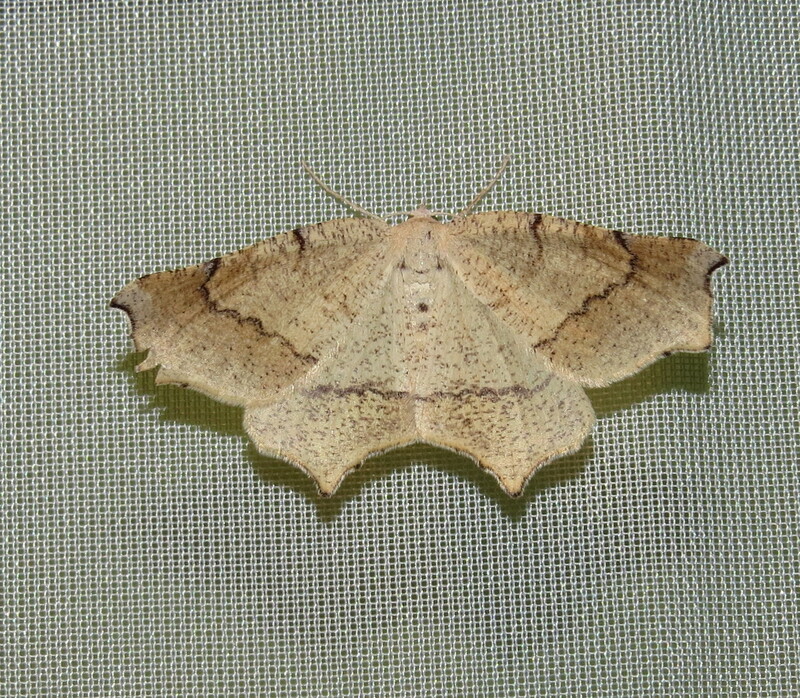 Members of the family Erebidae were once placed in other families, and I find it impossible to distinguish many of them from noctuids. 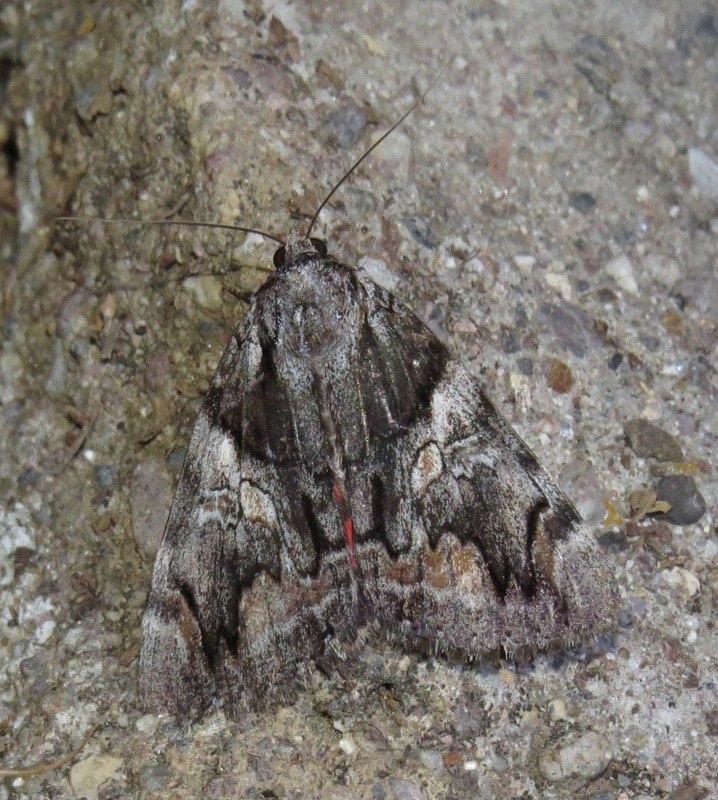 However, there is no mistaking the very large underwing moths of the genus Catocala. We were lucky enough to have one specimen grace us with its presence. 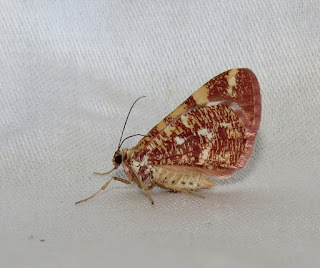 Normally, underwing moths do not come to lights, or they remain on the fringe of the lighted area if they do fly in. 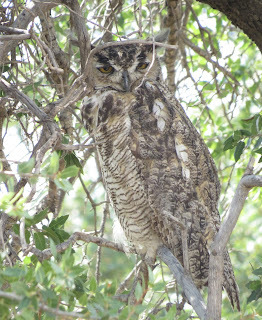 Heidi spotted this one in a tree, and we flushed it to where we could get better pictures. There were other insects that are more often heard than seen, too. 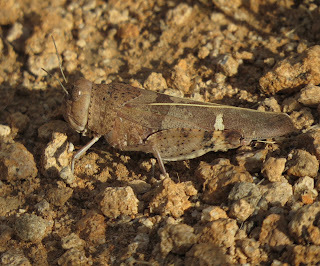 Tree crickets (genus Oecanthus) were still in abundance. 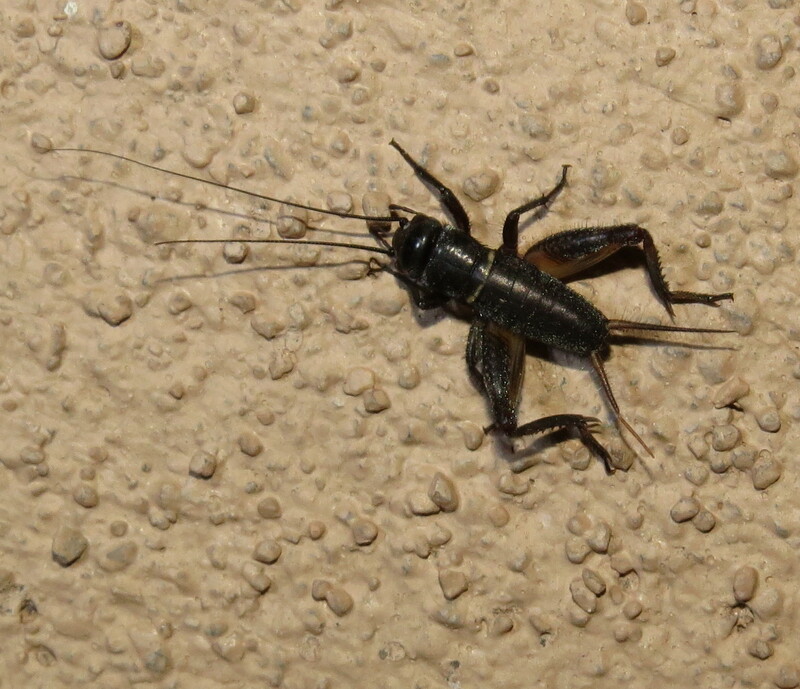 A field cricket nymph (Gryllus sp.) made a brief appearance, too. Male tree cricket, Oecanthus sp. 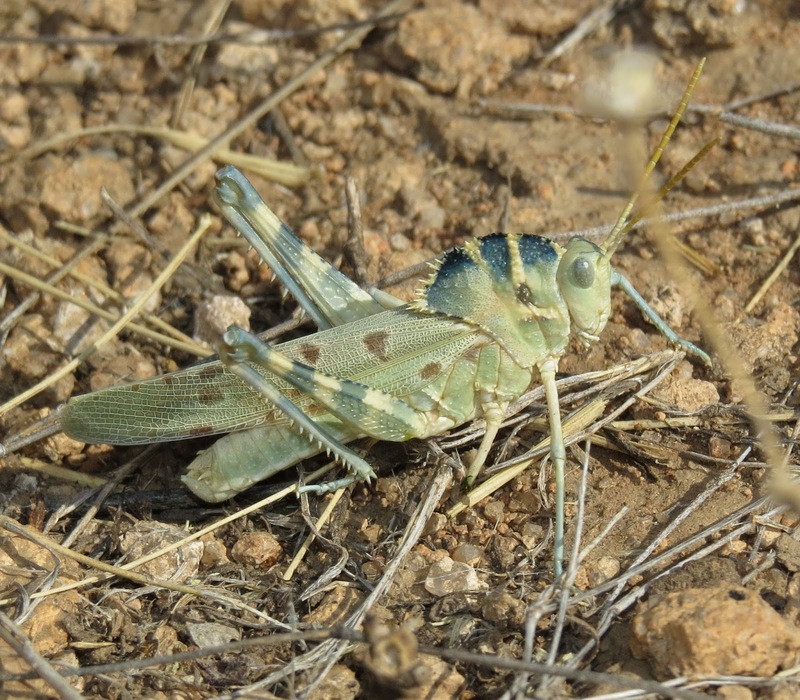 Nymph of field cricket, Gryllus sp. 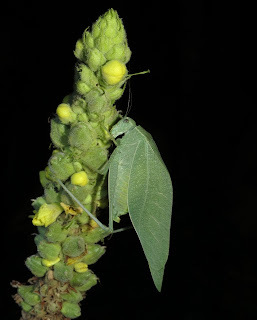 The most spectacular of all was a female Greater Anglewing Katydid, Microcentrum rhombifolium, apparently feeding on the mullein stalk we found her on (see image at top of this post). 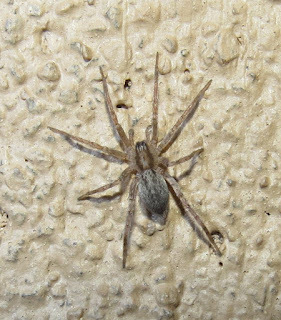 Equally adept at climbing was a parson spider, Herpyllus sp., and what I suspect was a juvenile prowling spider in the genus Syspira. 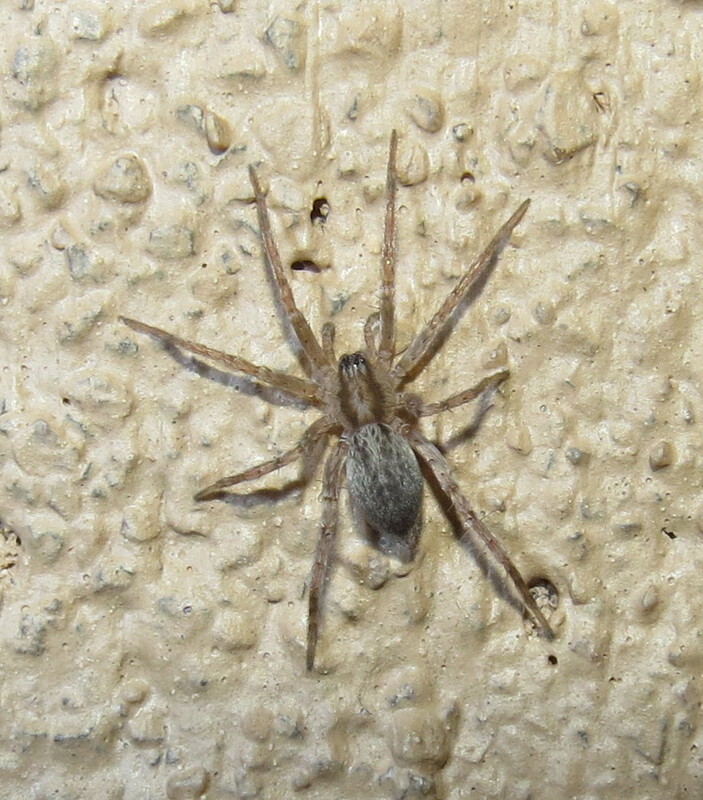 Juvenile prowling spider, Syspira sp. As the clock struck midnight, the increasing cold drove us to take down our set-ups and retire to the cozy confines of our respective residences. Many thanks to Dave and Shelley for their delightful company, hospitality (food and beverages especially), and sharing their blacklights. Never a dull moment. 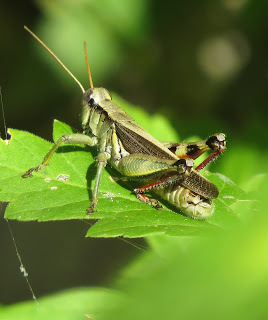 I encourage my readers to find each other and make a point of getting together informally to get to know each other, and explore together our amazing insect fauna. First of all, may I say how genuinely flattered I am that publishers think so highly of this blog that they are now offering to send me new books to review here. Let me also say that this sometimes puts me between a rock and a hard place. There is seldom a direct conflict of interest, but it is sometimes difficult to be as objective as I would like. 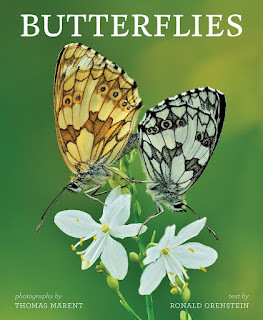 Take for example the new book Butterflies, written by Ronald J. Orenstein, with photographs by Thomas Marent. Butterflies is published by Firefly Books Ltd., a Canadian-based company noted for their visually stunning pictorial works, of which this "coffee table book" is no exception. Indeed, their press never disappoints. The organization of this book is straightforward and comprehensive, addressing the most important aspects of butterfly classification, life history, diet, and their role in the environment at large. The last chapter addresses moths, which ironically is a problem I have with the publisher, not the book. More on that later. This book got my attention with this assertion: "Butterflies are moths." Not only is this accurate, it is brave. In three words, the author turns all our usual assumptions about Lepidoptera on their heads. I could recommend this book for that reason alone, but there is more. Orenstein's text is perfectly tailored for a general audience and educated reader. Scientific terms are defined within the text, but in a way that still renders the narrative smooth and engaging. This is not easy to accomplish and the author deserves great credit for his skill. The words are in white, on a black page, which lends an elegant air to the book, but may or may not make reading more difficult for someone with visual difficulties. Photographer Thomas Marent is based in Switzerland and, unfortunately, that bias shows. 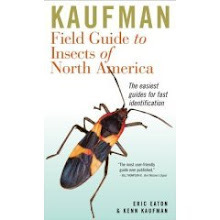 An overwhelming number of images are of species found in Switzerland, or Europe in general, and this is a typical flaw with most popular entomology books produced outside of the U.S. I could write forever about the shortcomings of U.S. publishers when it comes to nature and science titles, but back to this particular book. Images of butterflies from Australia, Peru, Africa, and other locations around the globe are also included. In fact, the location where each image was shot is always given in the caption, a refreshing detail that needs to become standard for all such books. Now to expose my own bias. Butterflies, as a book subject, have been done to death. The phrase "familiarity breeds contempt" comes immediately to mind whenever I am confronted by yet another volume devoted to them. 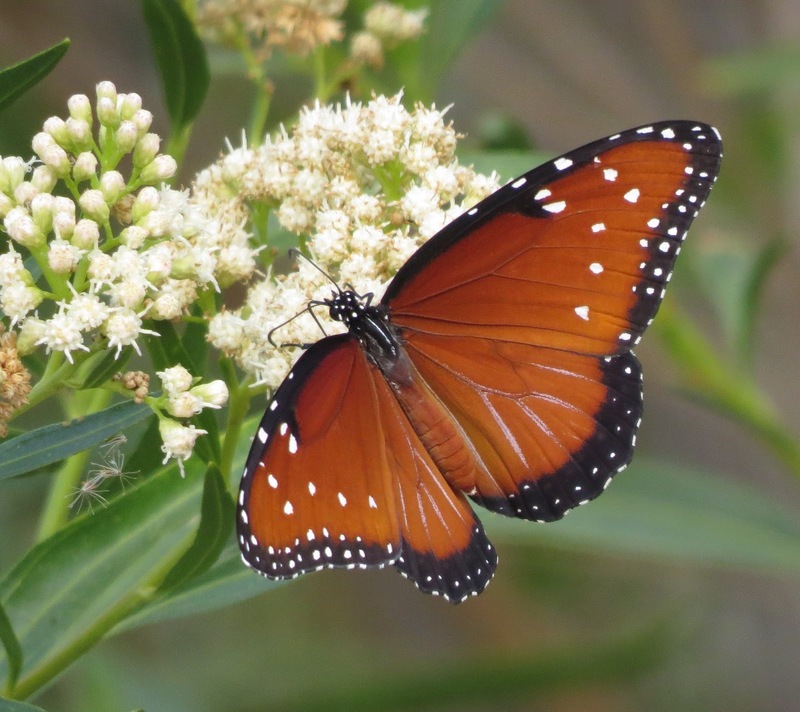 Butterflies are already popular. Publishers are loathe to take risks by approving proposals for books on other kinds of insects, even in the face of a growing popular appreciation of moths (the ones that aren't butterflies). There needs to be a book like Butterflies that is devoted to moths. Period. I could guarantee it would be a best-seller or nearly so, in the hands of the right author. Despite my inherent reservations when I received the book, Butterflies exceeded my expectations and I can honestly give it a ringing endorsement. It is also priced reasonably considering the quality and quantity of imagery. You will find more images and another opinion on Colin Knight's blog. 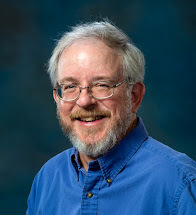 He also includes helpful links to Ron Orenstein's blogs. The plan for Sunday, August 30, was to visit The Nature Conservancy's Mimbres River Preserve, appropriately located on a former ranch along the Mimbres River. The morning dawned bright and warm, but a violent thunderstorm had run over City of Rocks State Park the night before, and many of those camped there were literally swamped by water gushing through their campsites. So, we had fewer party members as a result. 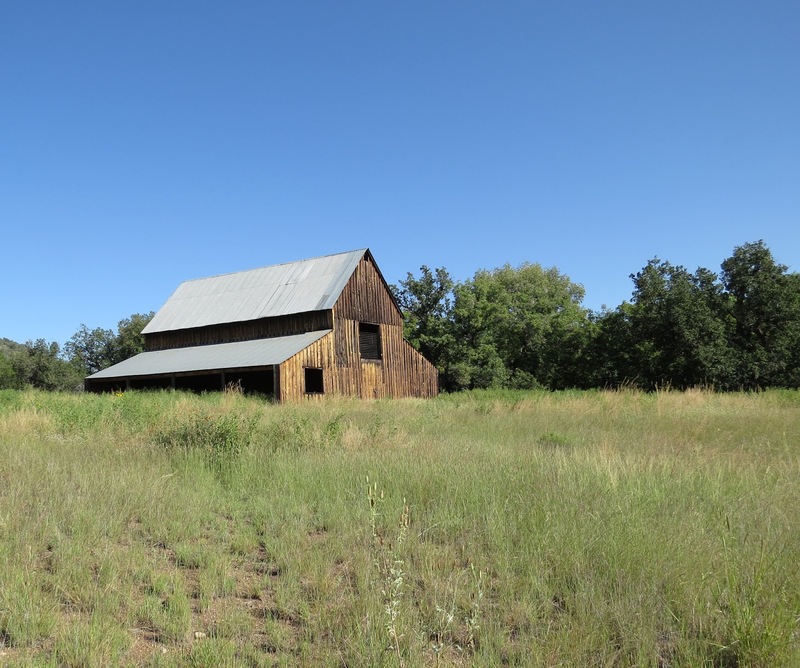 The preserve is located off highway 35, but the entrance is not terribly conspicuous. 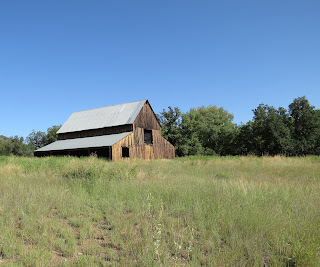 A wonderful old barn marks the trailhead, and it is a short walk to the edge of the Mimbres River. 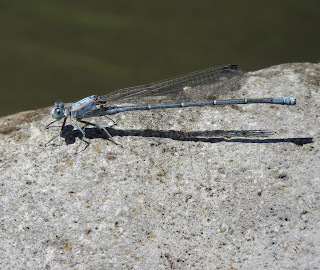 We did not see any new dragonflies or damselflies, but there were plenty of other insects to catch our attention. 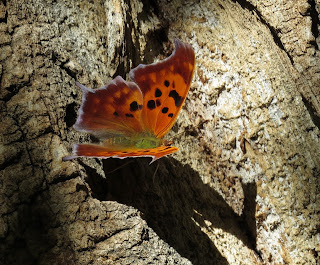 A Questionmark butterfly was basking on the trunk of a cottonwood, for example. 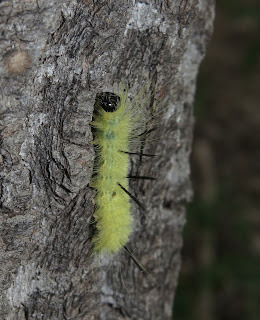 Caterpillars of the American Dagger Moth, Acronicta americana, were abundant in the vicinity of box elder trees. 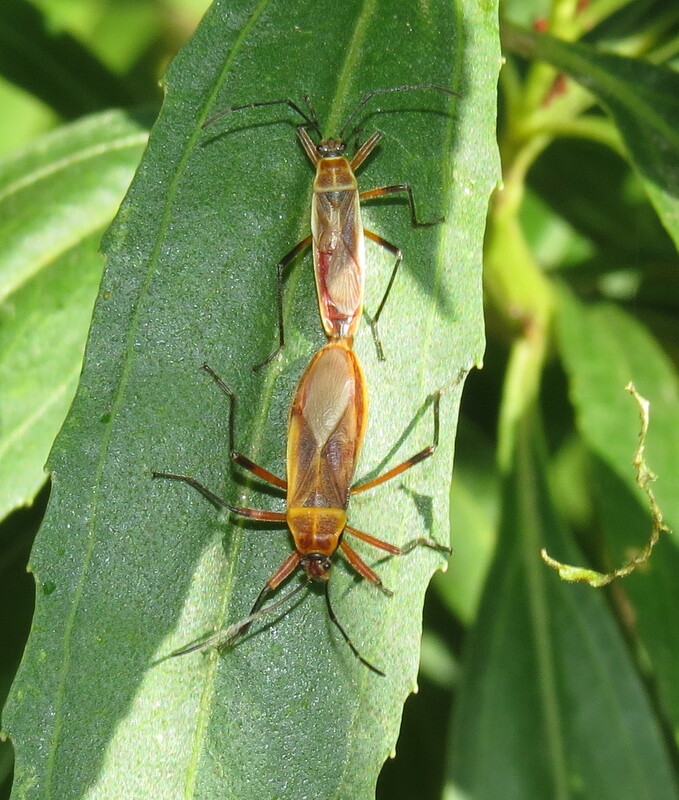 Largid bugs, Stenomacra marginella, were in extreme abundance on the foliage, stems, and flowers of Seep Willow, Baccharis salicifolia, along with aphids and insects attracted to aphid honeydew (the sweet, sticky liquid waste product of aphids). I also found a specimen of Yarrow's Grasshopper, Melanoplus yarrowii, a species I had not seen before. Would you believe there was a mushroom sprouting in the riparian zone? The contrast between the moist, shady riverbank and the arid grassland adjacent to it was quite stark. One of the more colorful finds of the morning was this lovely orange owlet moth,Chrysoecia atrolinea. From the Mimbres River Preserve we progressed up the road to Bear Canyon Reservoir. 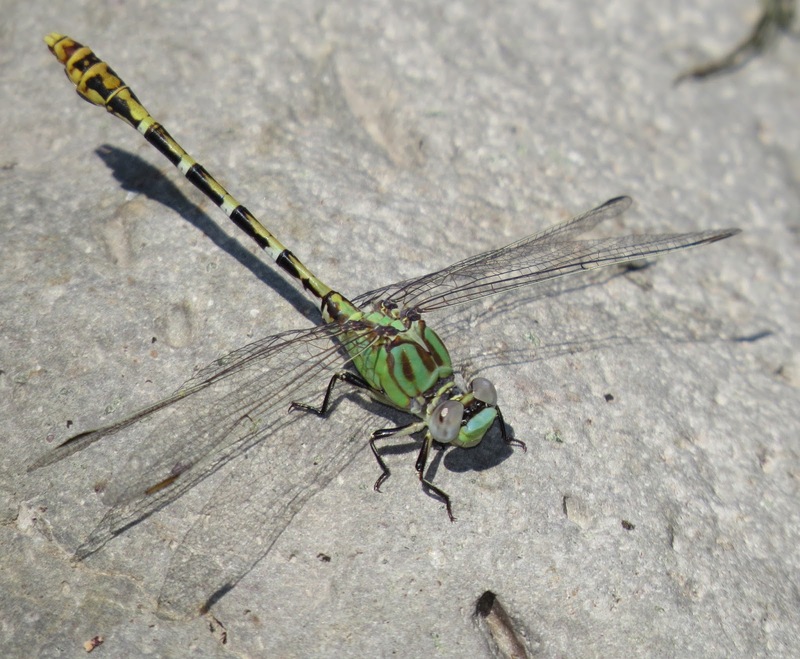 There, we picked up some of the more common and widespread dragonfly species that had eluded us until then. 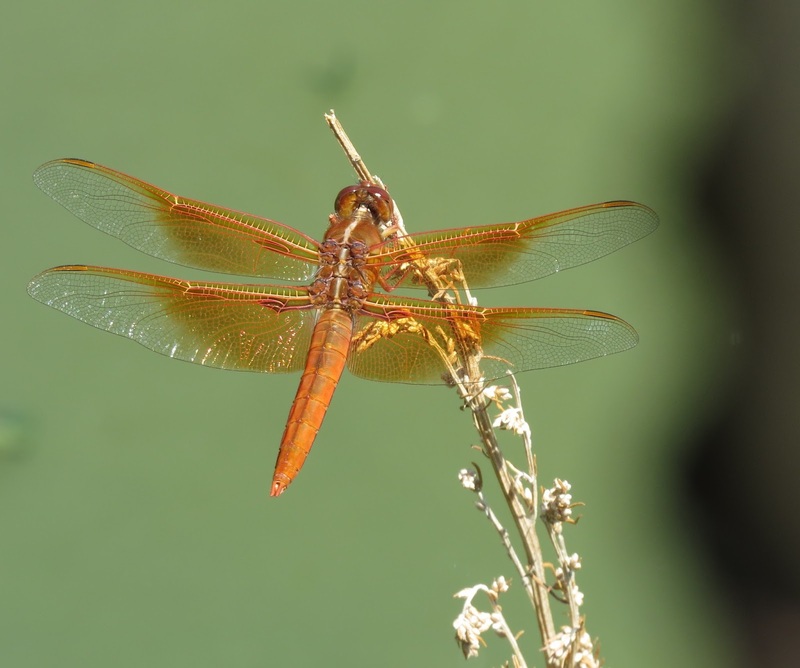 That included a Widow Skimmer and two Eastern Amberwing dragonflies. 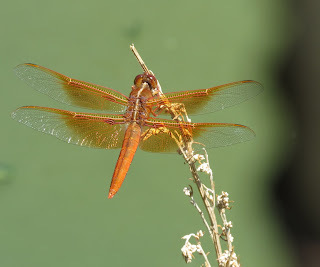 Some of our best photo opportunities for Flame Skimmers came here, too. 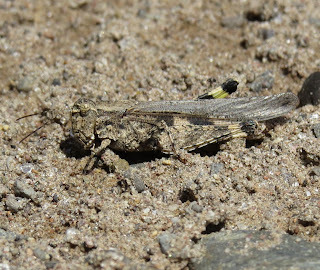 Meanwhile, I found the Ridged Grasshopper, Conozoa carinata, occupying the parking area. 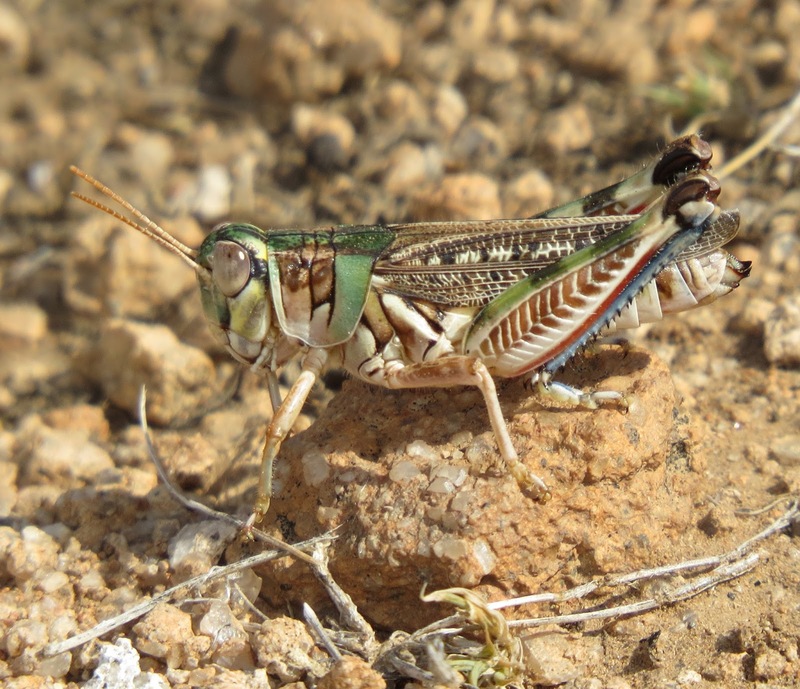 Also conspicuous were a couple of Plains Lubber grasshoppers, Brachystola magna, the largest grasshoppers in that area of New Mexico. 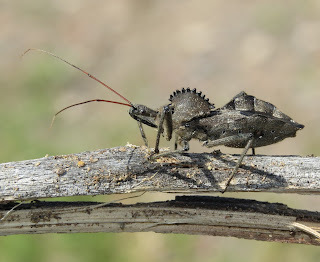 Did I mention that Heidi also fished a Wheel Bug, Arilus cristatus, out of the lake? 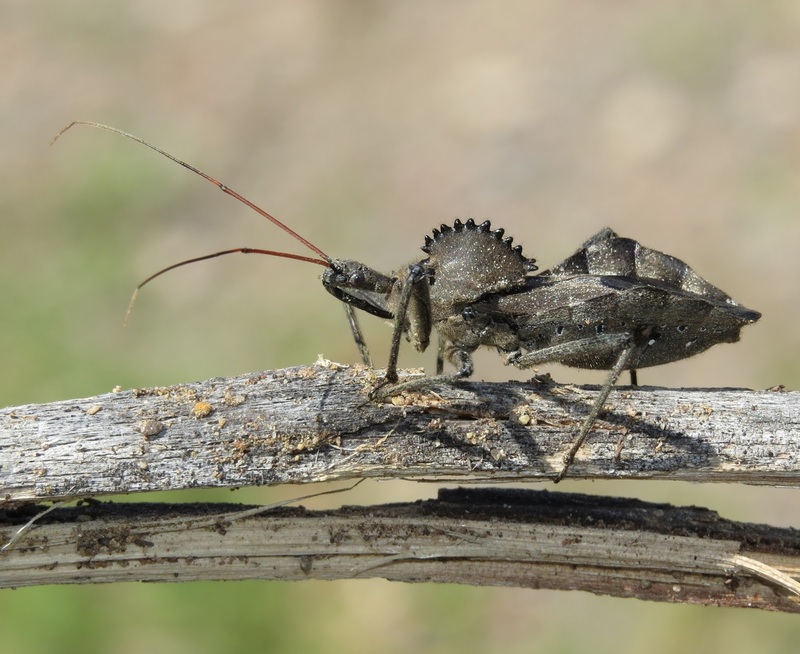 These large assassin bugs are always a treat to find, especially here in the west where they are less common than in the plains and canyons of the southern Midwest. Bear Canyon Reservoir was our last "official" destination, and from there we all went our separate ways, concluding a most successful event in every sense of the word. We found lots of interesting species, some of them county records, and made many new friends. This could well become an annual event. Heidi and I decided to go back to City of Rocks State Park to explore some more, and find some geocaches. 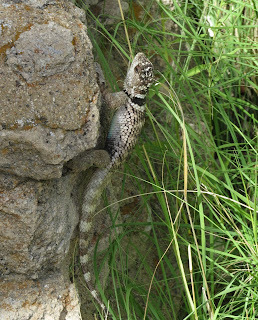 We were rewarded with some spectacular wildlife. Heidi has very sharp eyes, and she spotted a pair of Great Horned Owls in one of the few trees scattered between the rock formations. We also saw a couple of Northern Mockingbirds, Canyon Towhee, and Blue Grosbeak. Another stand of blooming Seep Willow near the park's campgrounds was humming with insect activity, including Queen and Bordered Patch butterflies, tarantula hawks and other spider wasps, scoliid wasps, and various flies. 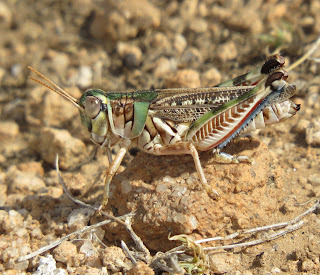 Thomas' Two-striped Grasshopper, Melanoplus thomasi, caught my eye due to its rather large size, and the fact that it is blue! 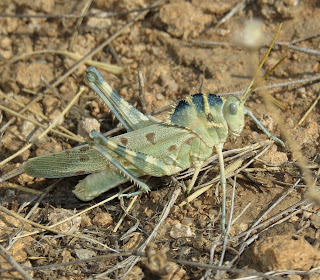 We decided to drive up the Observation Road to get a scenic view, but I was quickly distracted by the variety of grasshoppers living on the top of the hill. 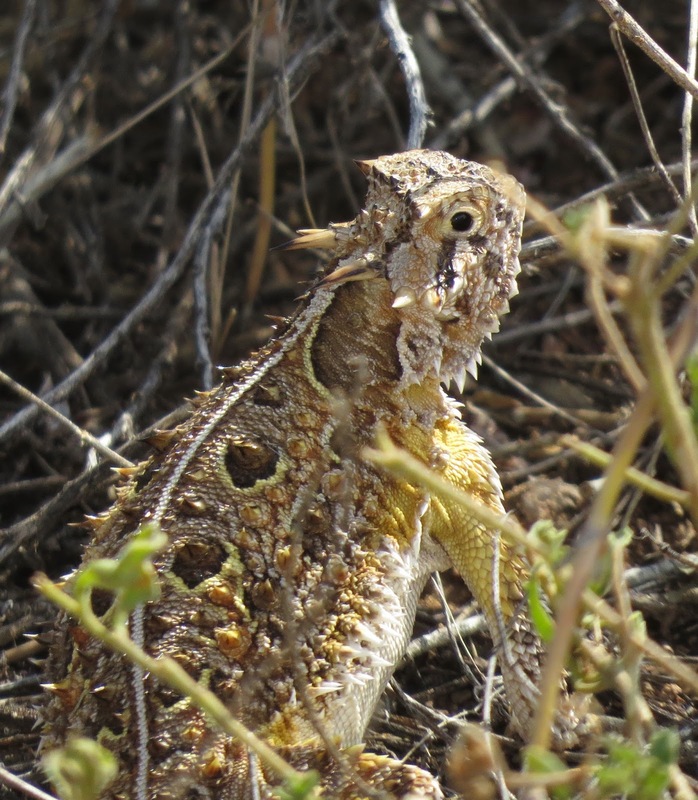 Heidi managed to spy something even more cryptic: a Texas Horned Lizard. 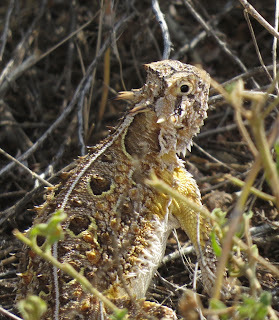 Make that two Texas Horned Lizards. These remarkable reptiles are specialist predators on harvester ants. 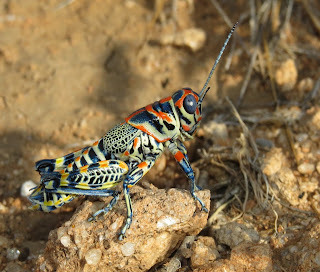 I could do an entire blog post on the grasshoppers I found in about an hour on that hill, but here is some eye candy to give you an indication of the diversity. 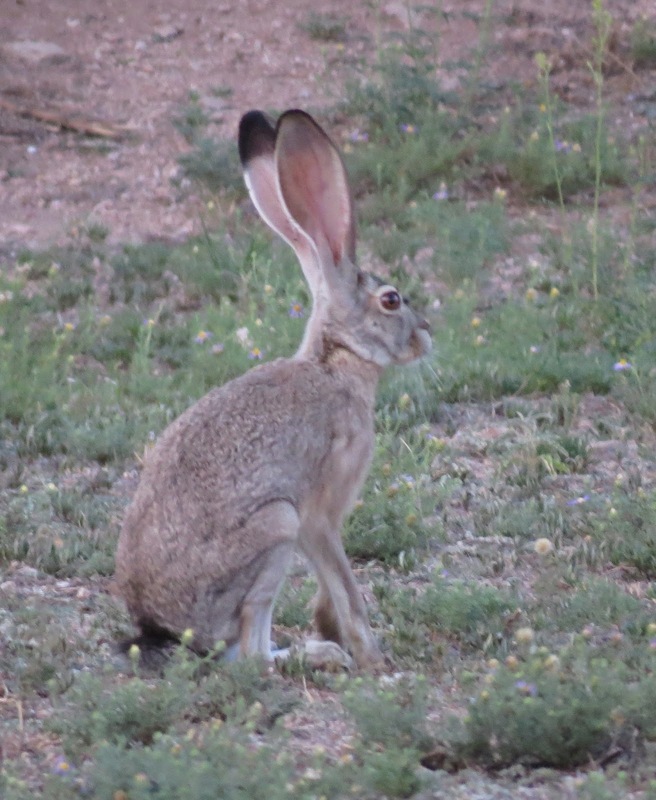 Our entire experience in southeast New Mexico was highly enjoyable, and we still had the evening to come and the drive back home to look forward to. Stay tuned, there is more excitement to come. There has been a great increase in concern, and spread of misinformation recently in response to a press release and policy paper earlier this month. 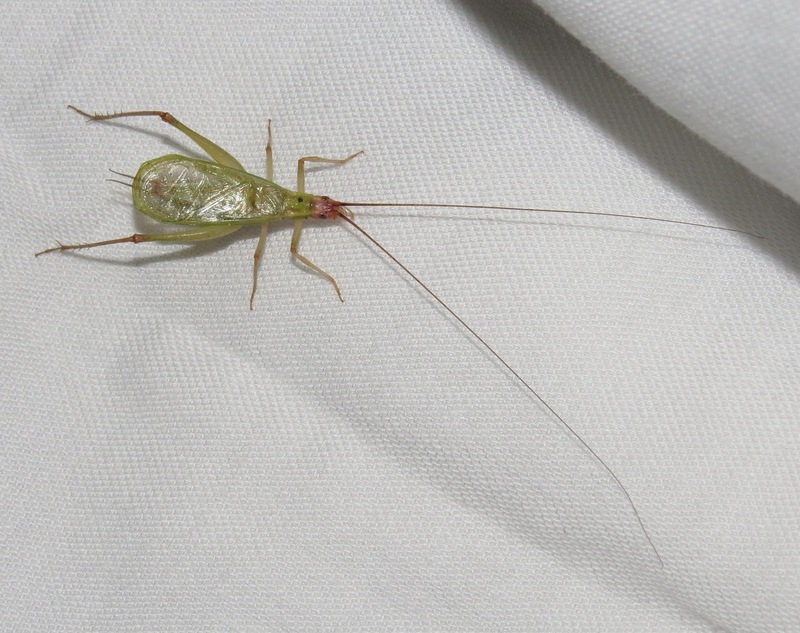 The publication advocates for more research into Chagas disease, caused by a parasitic organism, Trypanosoma cruzi, carried by assassin bugs in the subfamily Triatominae. 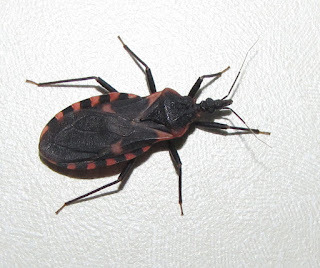 The result in social media especially has been the misidentification of nearly every indoor "bug" or assassin bug as a "kissing bug" carrying Chagas. 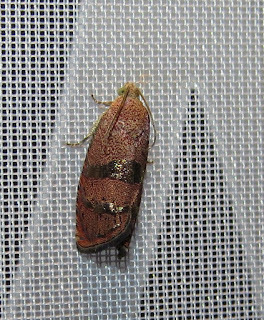 I wrote about our U.S. species of Triatoma in an earlier blog post, and that information remains largely correct. The post also includes information about species regularly confused with Triatoma species. There is no question that it is in the best interest of governments and scientific institutions to devote more resources to treating and preventing tropical parasitic diseases as the climate continues to warm and new disease vectors spread northward; and as parasitic organisms develop resistance to conventional medicines. The elephant in the room, however, is the increasing population of human immigrants to the northern hemisphere in response to economic suffering and political violence or unrest. Rural poverty continues to be the reason that many parasitic diseases proliferate, and the driving force behind immigration to nations experiencing relative prosperity and economic opportunities not found in the countries from which immigrants originate. Victims often carry Chagas disease without showing obvious symptoms, serving as a reservoir for the parasite. Pets, especially dogs, and livestock can also carry the parasites responsible for Chagas. This should not make immigrants, legal or otherwise, enemies of native U.S. citizens, but I fear it is only a matter of time before it becomes a political football, just another excuse to "reform" our immigration policy. 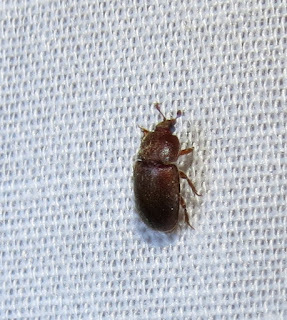 Furthermore, our native species of Triatoma are poor vectors of the disease, which is transmitted when the insect defecates while feeding. 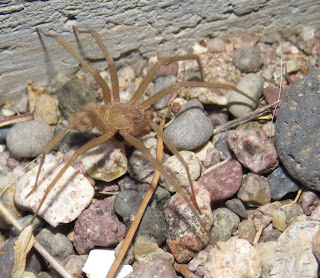 The victim of the bite then scratches the parasite-infected feces into the bite wound, or may absent-mindedly rub their eye or other mucous membrane. Our kissing bug species are "potty trained" and nearly always poop after they have left their host. 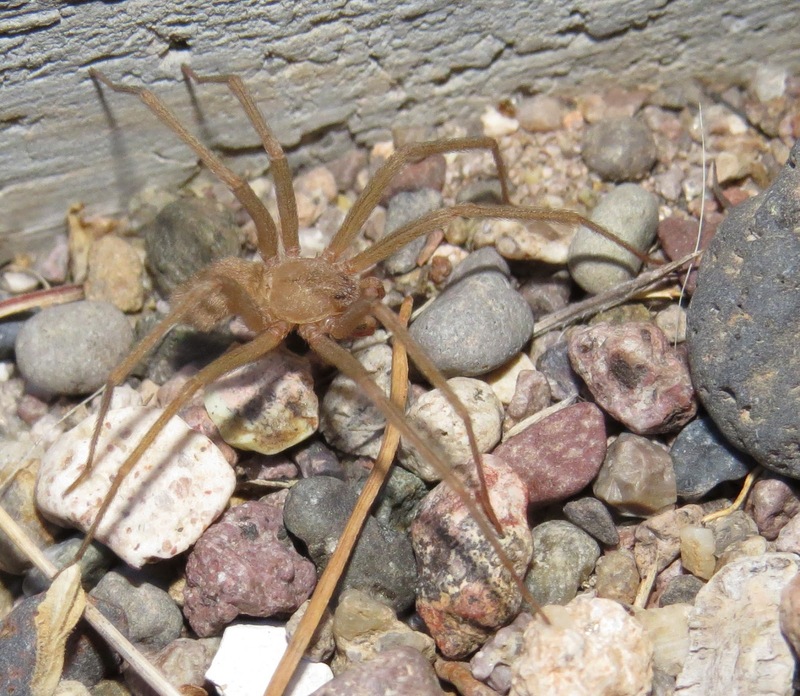 My friend Richard Fagerlund gave a succinct and accurate assessment of the status of kissing bugs in New Mexico for a television news report, but his advice applies to the rest of the southern U.S. as well: There is simply nothing to be concerned about in urban areas, and simple preventive measures in rural areas, such as keeping your property free of wood rats, almost completely eliminates the prospect of encountering them. Please help me spread the message that there is no need to panic, especially at this time of year. 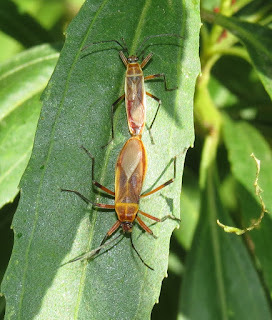 Kissing bugs are late spring and summer insects, only rarely showing up in autumn. If you are finding an insect in your home right now, it is almost certainly not a Triatoma. 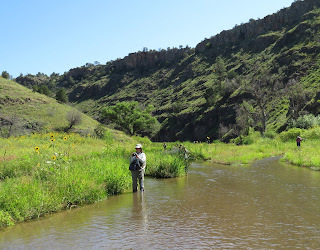 Saturday, August 29, found us wading up the Middle Fork of the Gila River, accessed at a point near the visitor center for Gila Cliff Dwellings National Monument. This is yet another scenic canyon, full of wonderful flora and fauna. 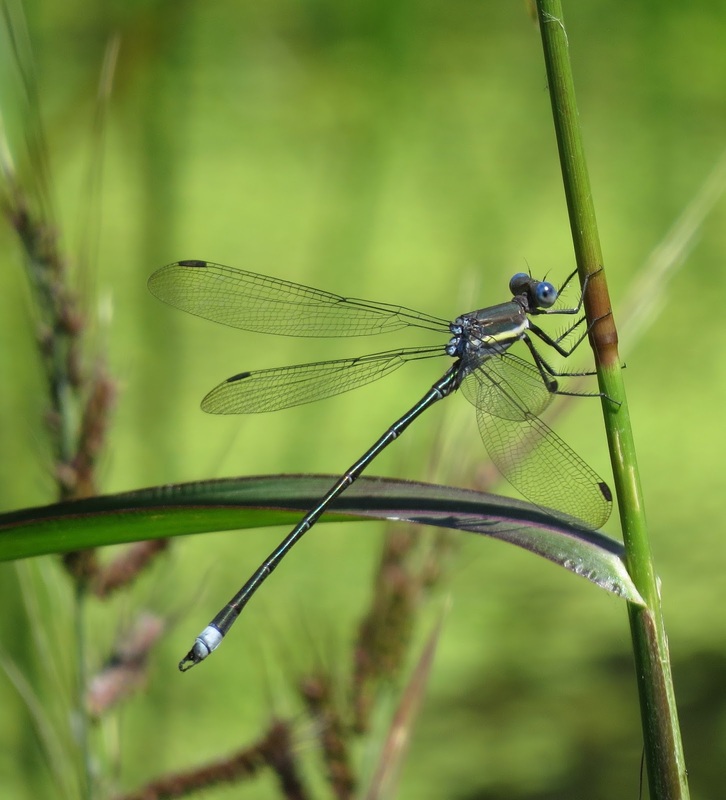 Rubyspot damselflies were again abundant, but this time it was American Rubyspots, Hetaerina americana, that appeared to be most common. 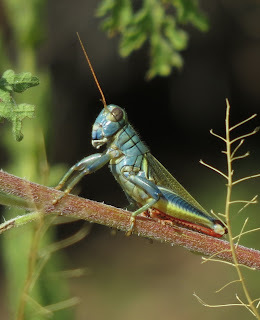 Despite how plentiful they were, I still can't seem to tell the difference between American and Canyon Rubyspot. Our party quickly split up in different directions, so some folks saw dragonflies and damsels that others did not. 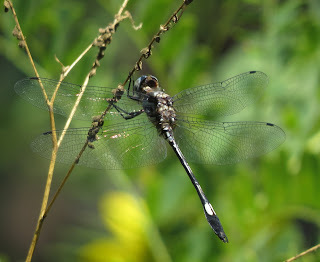 Rather than dwell on what I missed, I delighted in what I saw, including another "lifer" species, the Pale-faced Clubskimmer, Brechmorhoga mendax. 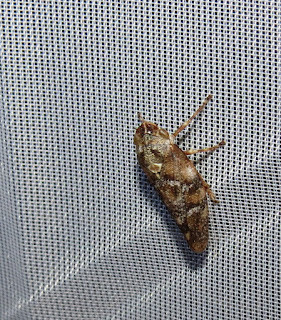 Someone netted a specimen the day before, but I was lucky enough to spot this specimen in flight and followed to where it perched. These dragonflies are in the skimmer family Libellulidae, but they look a lot more like clubtails (family Gomphidae). 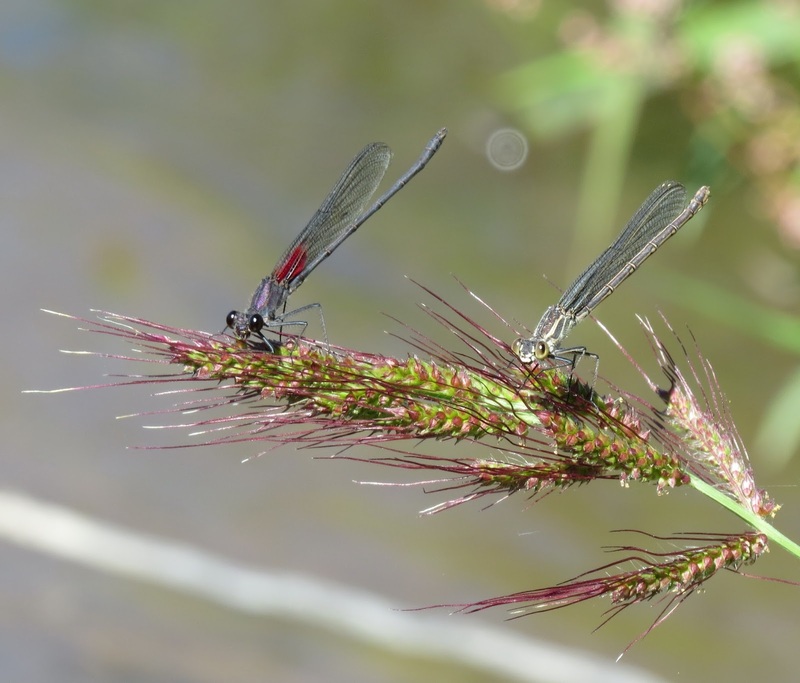 The fact that their eyes meet helps one to readily identify them as skimmers. 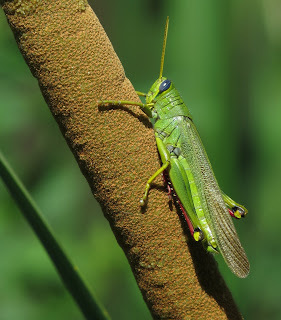 I am also alert to non-odonate insects, and was pleased to find a couple of nice specimens of the Green Bird Grasshopper, Schistocerca shoshone, clinging to cattails and grasses along the edge of the river, and on islands in the middle of the river. 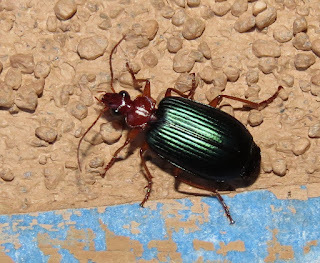 A lovely metallic blue beetle with an orange pronotum (top segment of thorax) also caught my eye. 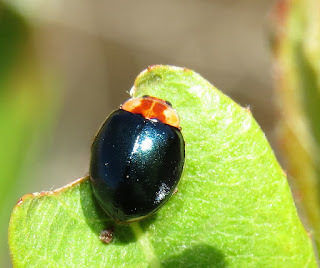 I later determined it to be the V-marked Lady Beetle, Neoharmonia venusta ampla. 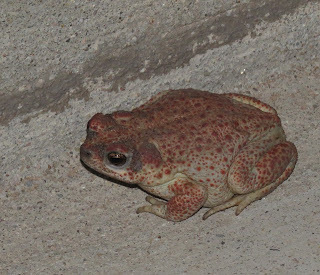 This subspecies is found only from central Arizona to south Texas, and is not that commonly encountered. There were animals other than insects, too. One of the cutest was an Arizona Toad that was hopping across a sand bar when we saw it. 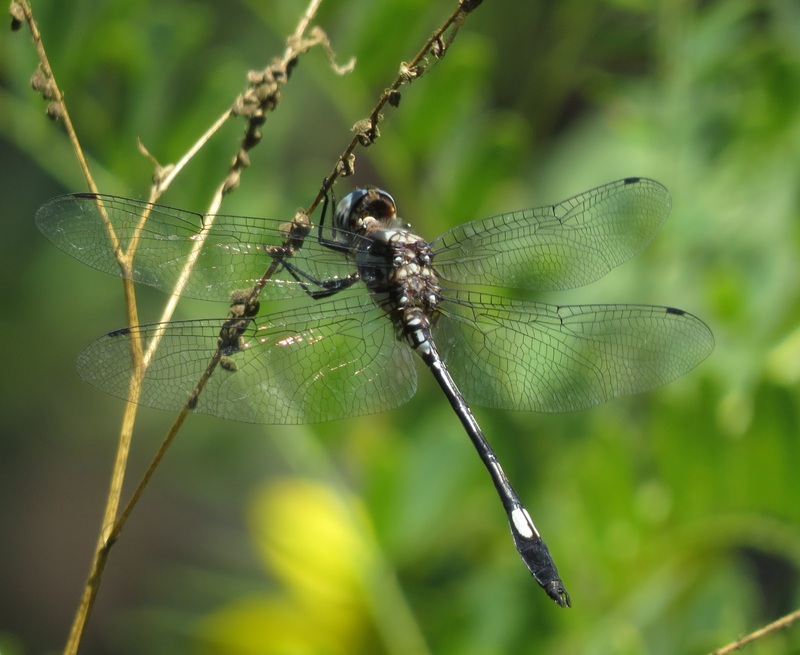 Many of the dragonflies we saw were species we had seen the day before, but I managed better images of some of the clubtails, like the Dashed Ringtail, Erpetogomphus heterodon. The solid green thorax, with relatively few brown stripes, helps to identify this lovely species. 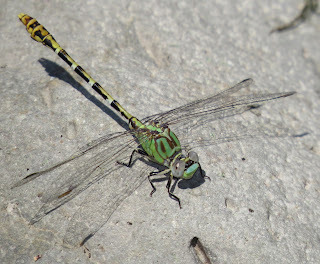 The White-belted Ringtail, Erpetogomphus compositus, by contrast, has a heavily-striped thorax. It might be better called the Zebra Ringtail. The white "belt" refers to the central stripe on the side of the thorax, which is white, not yellow-green like the adjacent patches. A perfect male specimen of the Great Spreadwing damselfly, Archilestes grandis, perched on a reed right in front of some of us. 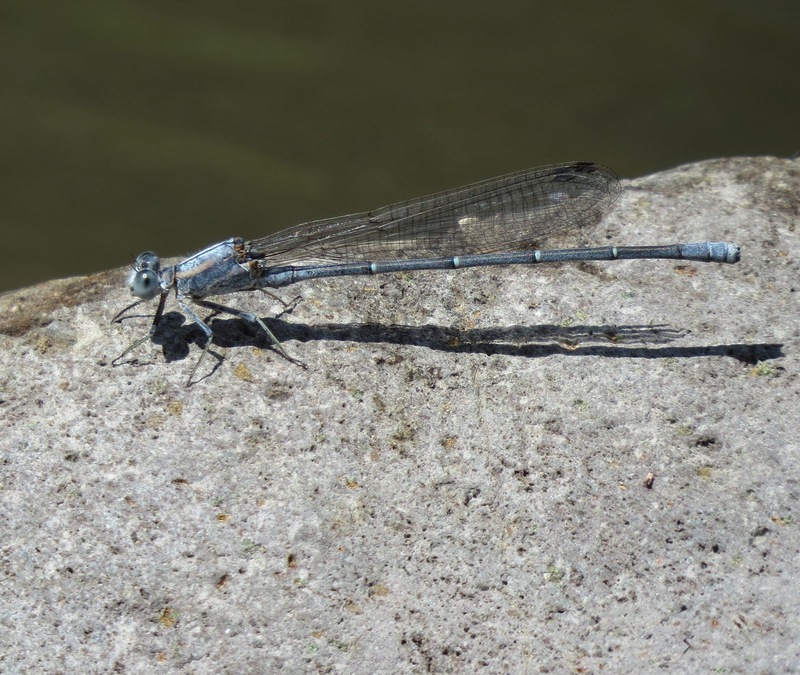 This damselfly is so large that it could easily be mistaken for a dragonfly at first glance. 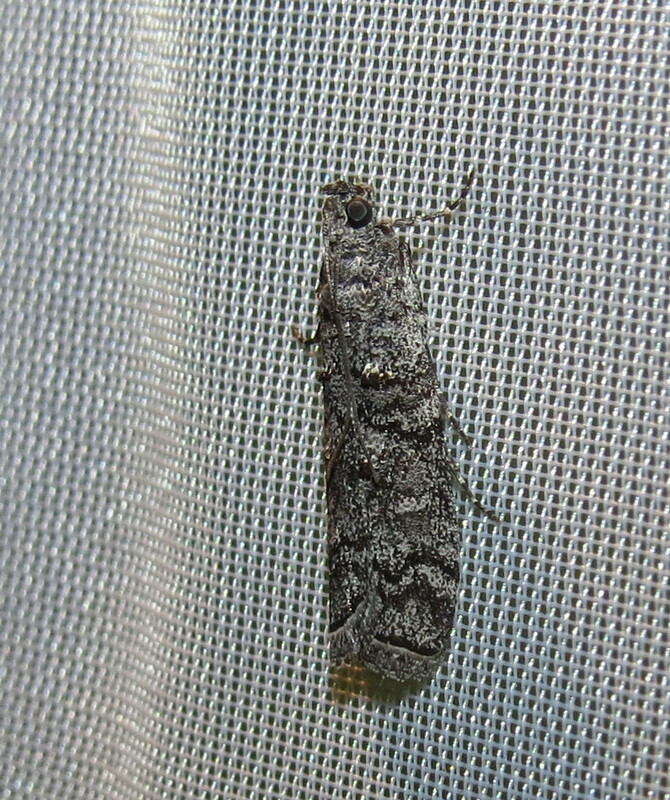 This is a common species over much of the U.S., but was a "first" for at least a few members of our group. 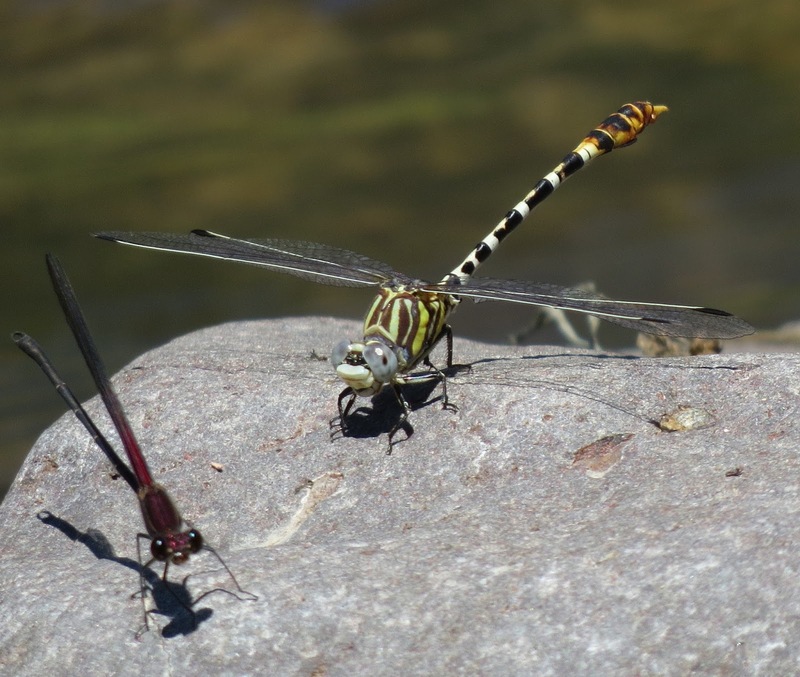 A bit more surprising was a male Powdered Dancer damselfly, Argia moesta, sharing mid-stream rocks with rubyspots and ringtails. 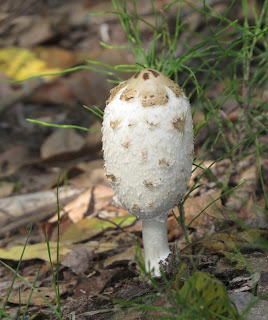 Mature male specimens are covered in pale blue pruinosity, a kind of waxy bloom that easily rubs off. This was the only individual we saw the whole trip. Once again, threatening weather descended, and we had to exit the canyon a little sooner than we would have liked. 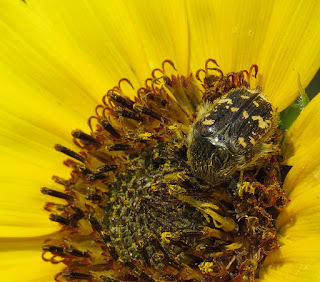 On the way out, Heidi spotted a very cryptic flower scarab beetle, Euphoria sonorae, inside a flower. After lunch, Heidi and I decided to see if the trail to the cliff dwellings was open. It is subject to closure in the face of impending electrical storms, but it was open, we paid the $5.00 entrance fee, and away we went. 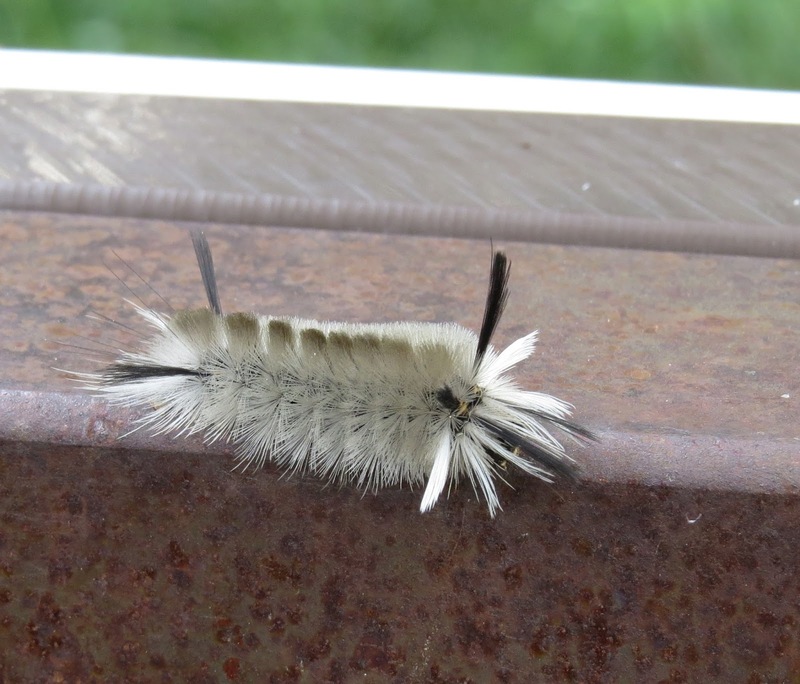 Crossing a bridge over a tributary of the Gila River, we found several caterpillars of a tiger moth in the genus Halysidota parading over the railings. Tents of the Fall Webworm, Hyphantria cunea, adorned many trees. 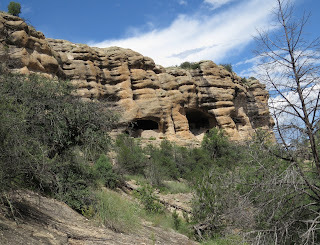 The trail is steep, with numerous switchbacks, but there are some nice views of the cliff dwellings. 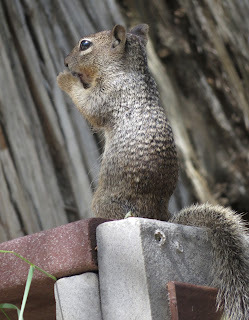 There are benches to take a breather if you need it, but this one was already occupied by a ground squirrel when we got to it. 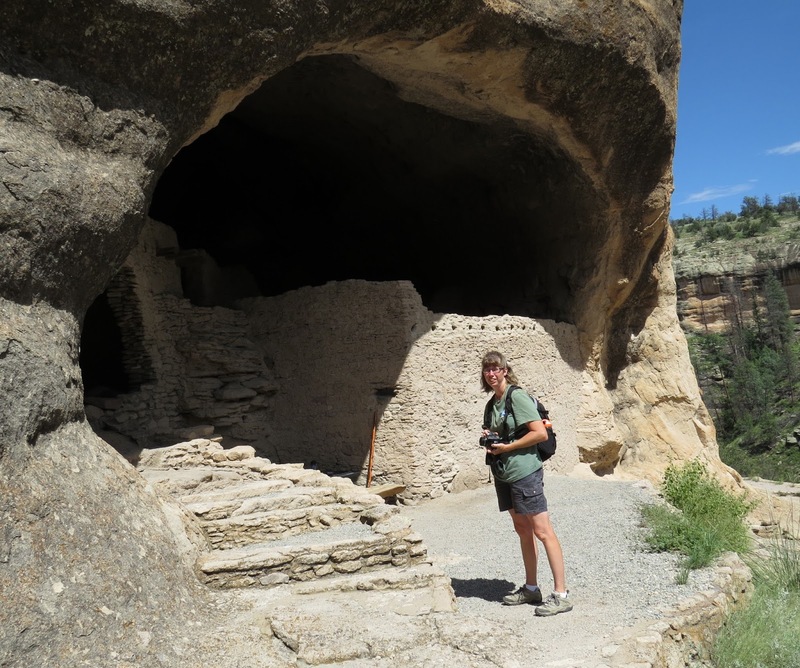 The cave dwellings are well worth the trip. The scale is quite surprising. Volunteers at the site help interpret the history and culture, and point the way to the exit, down a ladder! 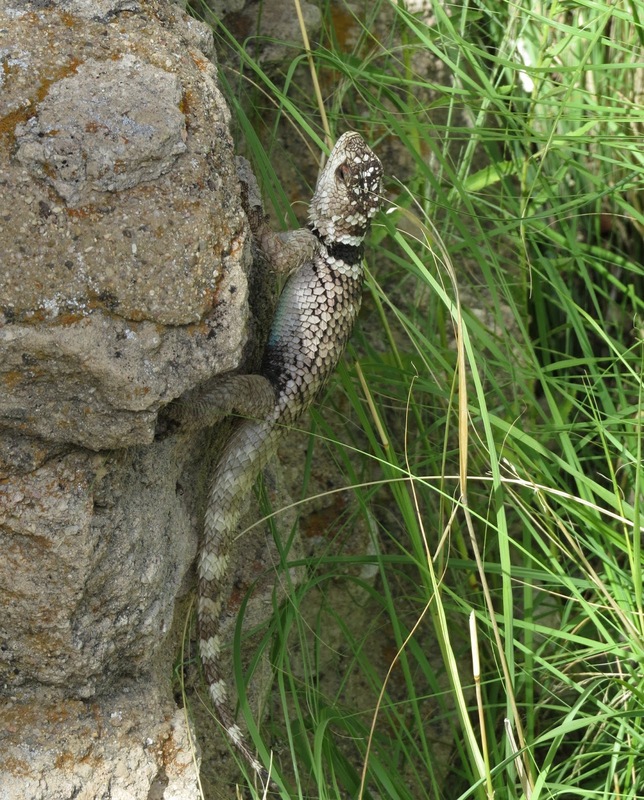 The most obvious occupants of the site these days are the Crevice Spiny Lizards. The reptiles in turn provide a home to bright red mites that speckle various parts of the lizard, especially beneath its "collar." 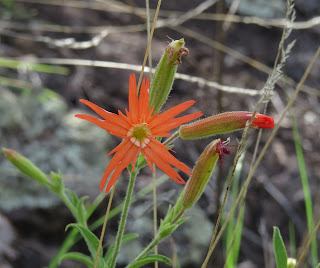 Wildflowers provide color at this time of year, too, and this catchfly, Silene laciniata, was one of the more intense blooms we saw as we descended from the cliff dwellings. 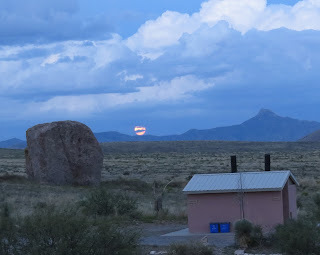 We decided to spend the remaining daylight by exploring more of City of Rocks State Park before an evening group picnic and astronomy presentation. A Black-tailed Jackrabbit put in an appearance at dusk, and then we were treated to a "super moon" rising above the, um, mountains in the distance. After dark, other creatures venture out. 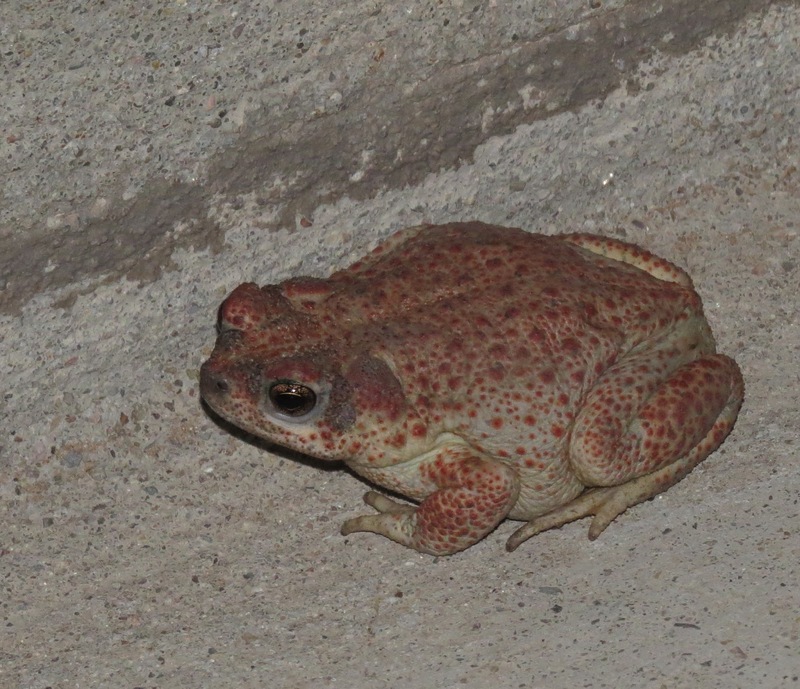 The park visitor center and restrooms are modestly lit, enough to draw insects, and spiders and other predators like this Red-spotted Toad. 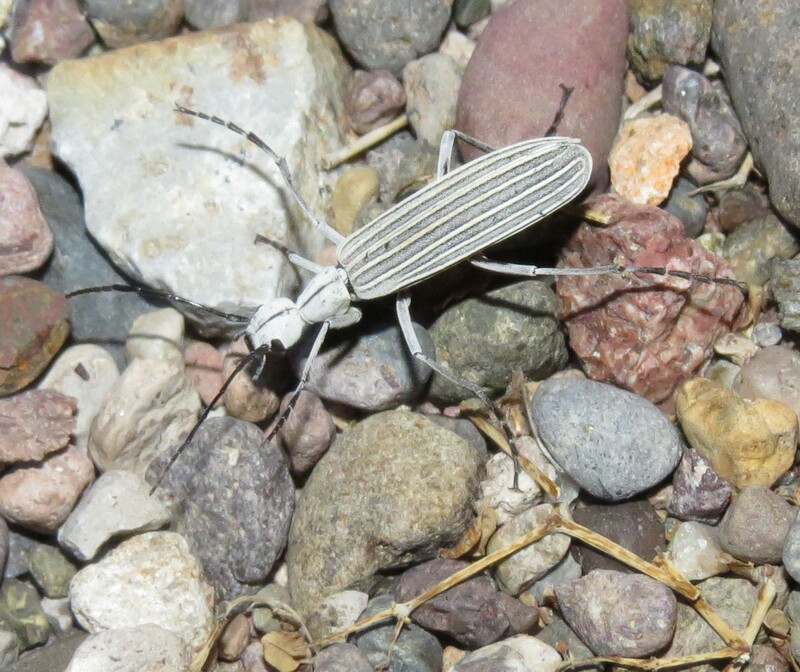 An Apache Recluse spider, Loxosceles apachea, and a large blister beetle in pinstripes, Epicauta costata, were among the other highlights of the evening. 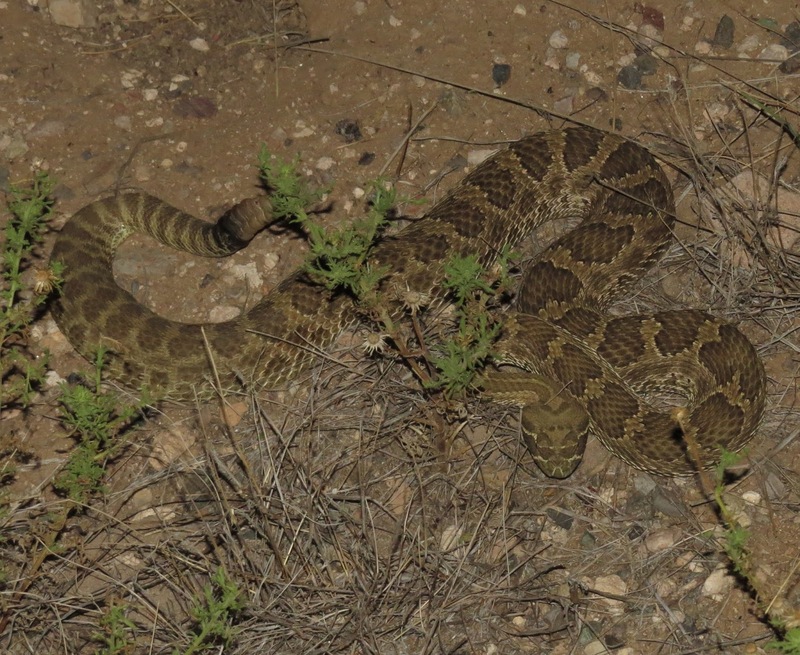 Our drive out of the park would have been spectacular were it not for a terribly unfortunate outcome to our encounter with a gorgeous Prairie Rattlesnake. It was stretched across our lane, soaking in the warmth of the asphalt. I got out to take pictures, and eventually move the snake to safety. Before I could do that, another vehicle approached from behind us. I had my insect net, and tried to wave the approaching car around us. 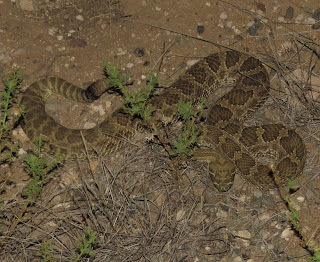 Instead, the driver and his passengers assumed we might be in trouble, and they came to a stop in front of our car, after driving right over the poor serpent. Miraculously, there was no external damage to the reptile, but it had to have sustained catastrophic internal injuries. I got the snake into my net and moved it off the road, hopefully to live out whatever remaining hours it had in peace. 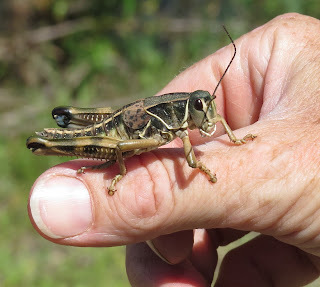 It turned out the party in the other car were college students with intense interest in herpetology and entomology. We exchanged pleasant greetings (after my initial outburst because I thought they had intentionally hit the snake), and then parted ways. It was a sad ending to an otherwise wonderful day, but more was yet to come.